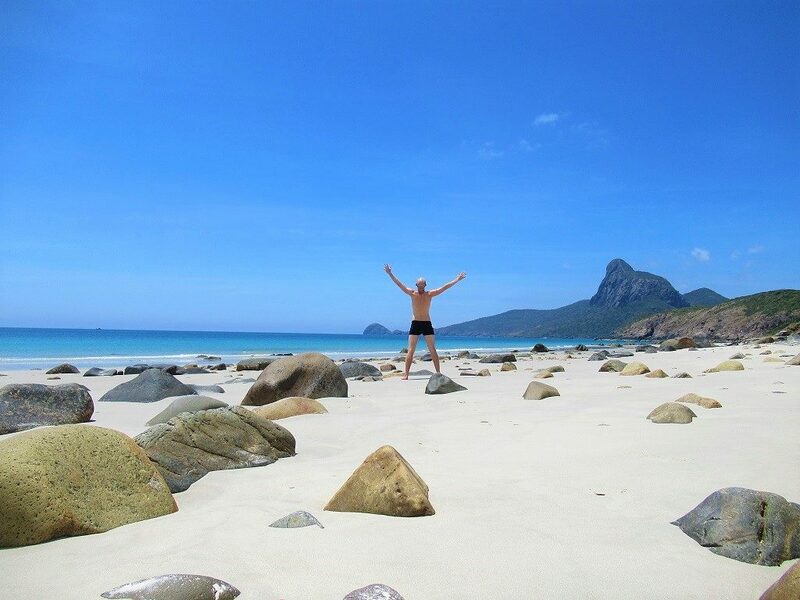 The Con Dao Islands is a remarkable place. You’re likely to experience two sides to the islands when you visit: one day spent swimming in the clear sea, walking upon white sand beaches, hiking in the jungle, riding a scooter along deserted coast roads, and drinking cocktails on the seafront promenade; another spent visiting the colonial-era prisons, learning about former inmates (many of whom are celebrated national heroes) and witnessing remnants of their forced labour, which caused thousands of prisoners to die. The former is the future of the Con Dao Islands as a tropical paradise; the latter is its past as a brutal penal colony. Personally, I have always felt deeply attached to the Con Dao Islands: a feeling which gets stronger each time I visit. But, the Con Dao isn’t for everyone. Some people lament to the lack of nightlife and complain about the relatively high costs, for example. However, if you’re a regular reader of this website, the chances are you share my general feeling for travel destinations, and you too will fall for these islands. On this page is my full guide, annotated map, and short film of this dazzling archipelago. This is an extensive (i.e. 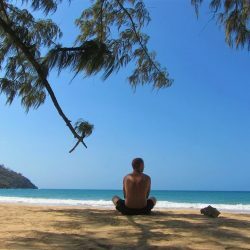 long) guide to the Con Dao Islands: I love this place and I want everyone who reads this guide to love it too. I’ve included all the information I can, and categorized it in a way that makes it easy for readers to find what they’re looking for. Click an item from the contents below and use the navigation buttons within each category to find your way around this guide. 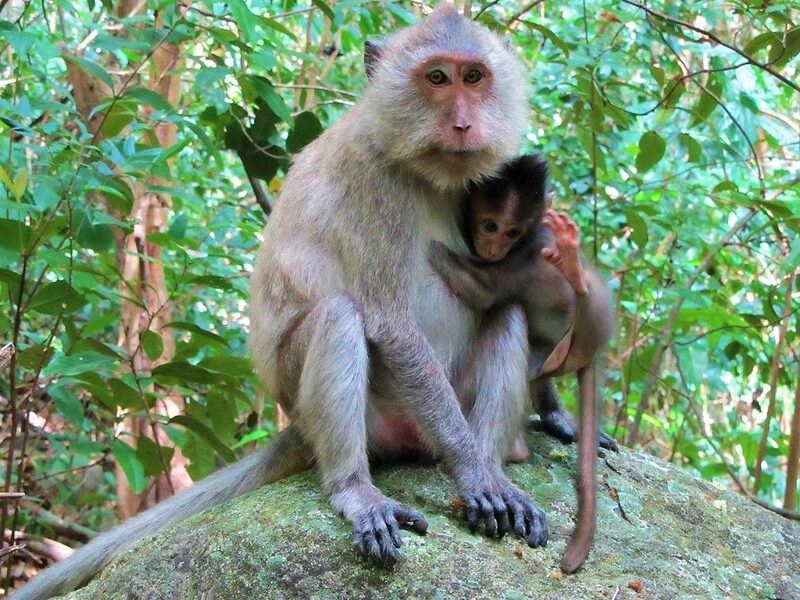 *Please support this website by using the relevant links in the following guide to book your accommodation & transportation on the Con Dao Islands. Thank you. 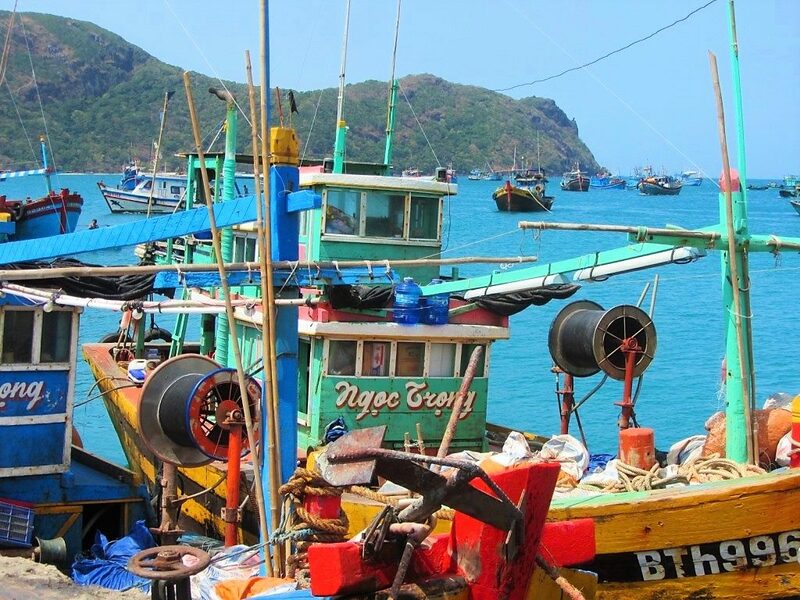 The Con Dao Islands has a population of about 7,000, most of whom are fishermen or part of the Peoples’ Army of Vietnam. According to some locals, men outnumber women 7 to 1 on the island. However, you’re unlikely to encounter anyone, male or female, as you walk along the seafront promenade. 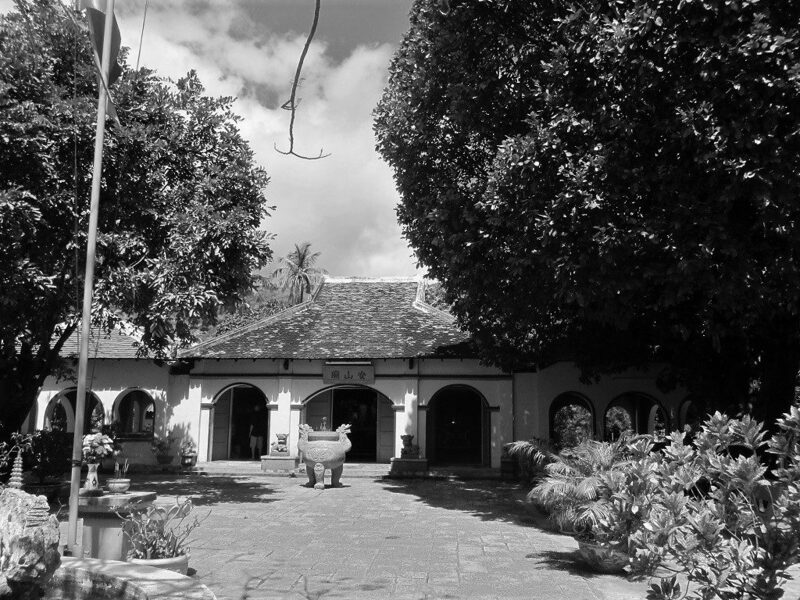 On one side, the glass-like ocean stretches to the horizon, on the other, French colonial villas crumble on street corners beneath the shadows of tropical trees, their roots twisted around the brickwork. It feels like an abandoned outpost of French Indochina. I’ve travelled all over Vietnam, but the first time I arrived in Con Son town I felt I’d really made it to the ends of the nation. As late as 2002, the only link to the mainland was a helicopter, which ran three times a week, carrying 24 passengers, most of whom were army personnel. 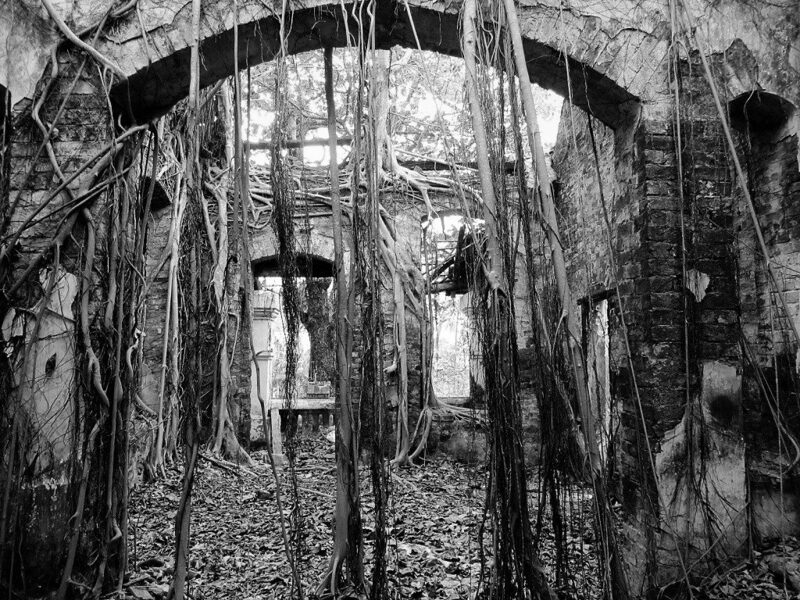 The prisons belong to the relatively recent past, but history and myth on the Con Dao Islands goes back centuries, and is often just as harrowing and macabre. Both the Malays and the Khmers held the islands for a time. Contact with the West started with Arab traders in the 9th century. After that, came the familiar succession of European colonial powers: Spanish and Portuguese mariners in the 16th century, the British East India Company in the 18th century (who set up a fort in 1702, but abandoned it a few years later, when they were massacred by their own mercenary workforce), and the French from the 19th century onwards. It is even said that Marco Polo, on his way back from China, took refuge on the islands during a storm in 1294. A visit to the new Con Dao Museum is a good way to get an overview of the history of the islands. 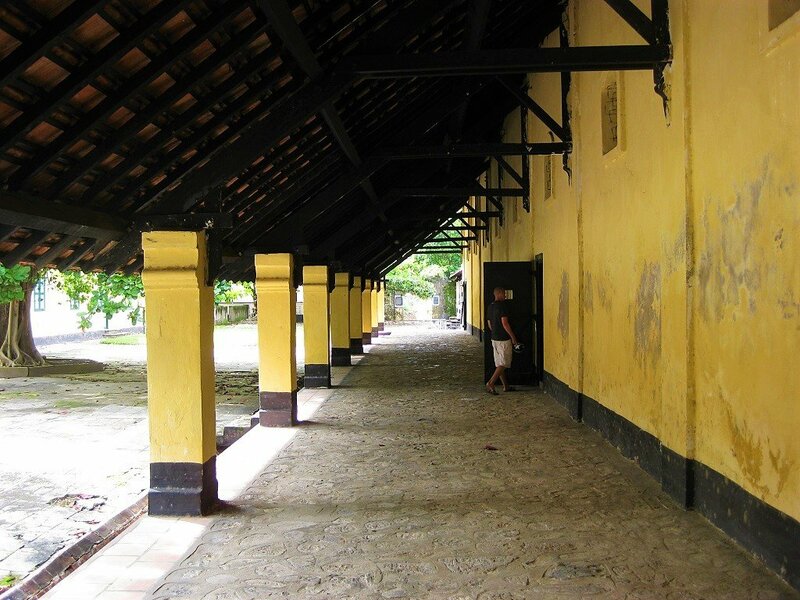 One story, part history, part legend, took place on the islands in the late 18th century and marks the advent of French colonial ambitions in Vietnam. The heroine is Phi Yen, or ‘Flying Swallow’. Phi Yen was one of the wives of Nguyen Anh, the last remaining prince of the Nguyen Lords, who ruled southern Vietnam from the 17th century. In 1783 Prince Nguyen Anh escaped capture from his military and political rivals, the Tay Son brothers, by retreating to the Con Dao Islands. He and Phi Yen took refuge in a grotto on the island of Hon Ba. Nguyen Anh sought the help of Pigneau de Behaine, an influential French missionary in the Mekong region. The Prince agreed to cede the Con Dao Islands and the port of Danang to the French, in exchange for their military support in defeating the Tay Son brothers and returning him to power. In 1787, Louis XVI agreed to the treaty with Nguyen Anh, but was overthrown in the French Revolution of 1789 before the treaty could be realized. However, some military support and supplies still got through to Vietnam, allowing Prince Nguyen Anh to wage war on the Tay Son brothers. In 1802 he was victorious and declared himself ruler of all Vietnam. 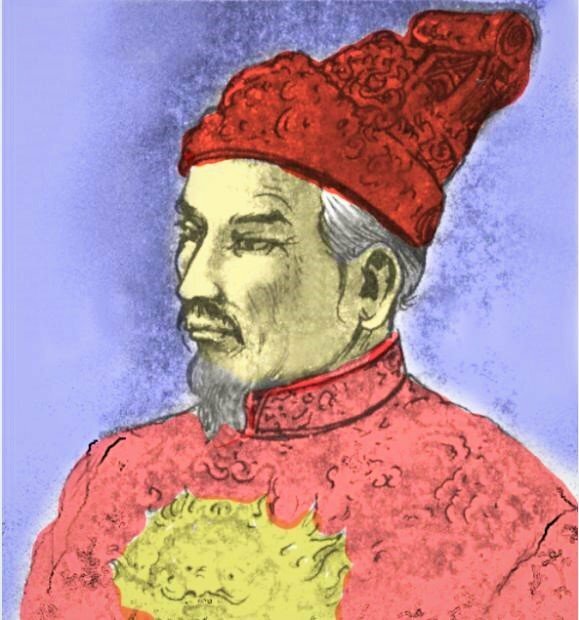 He took the royal title, Emperor Gia Long, and moved the imperial capital to Hue, beginning what would be Vietnam’s last imperial dynasty. But the stain of French assistance would haunt Gia Long and his successors, until the dynasty became nothing more than an impotent arm of French Indochina. Today, Nguyen Anh is a much-maligned figure in Vietnamese history, a fact attested to by his lonely, seldom-visited tomb on the banks of the Perfume River, outside Hue. At the tip of the headland that juts out south of Con Son town is Mũi Cá Mập (Shark Cape). A fierce wind smacks the side of your scooter as the road twists around the cape to reveal the best view on the island. Looking down, you can see the road cutting along the coastline below the windswept southern slopes of Núi Thánh Giá, the highest mountain on Con Son Island. Big boulders that were dynamited during the construction of the road, (also paid for with prisoners’ lives), lie strewn on the sea side of the tarmac, decreasing in size as they roll down to meet the rice-white sand and gin-clear water of Nhat Beach, behind which the Jurassic Park-like island of Hon Ba looms (where Prince Nguyen Anh and Phi Yen are said to have stayed). This is my favourite beach on Con Son Island. 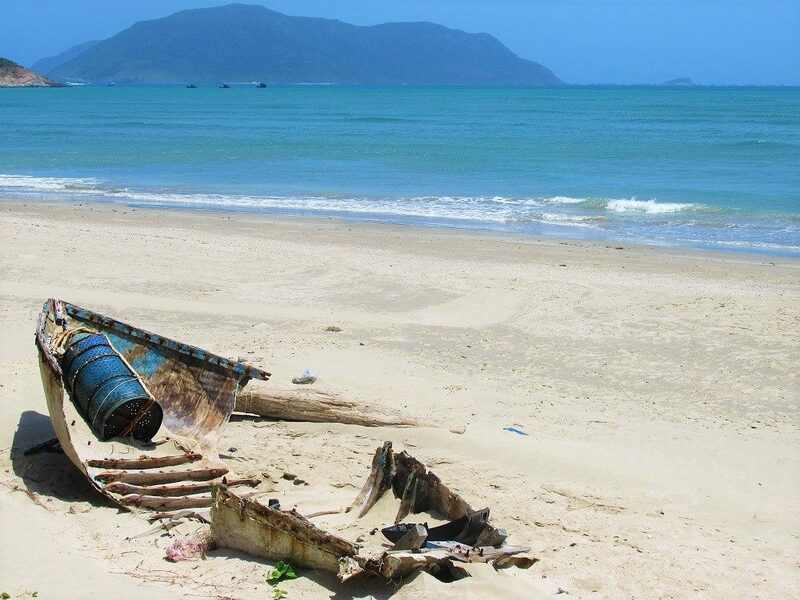 In fact, it’s one of my favourite beaches in all Vietnam. The swimming is excellent, especially before noon, when the water is often calmest, and when the tide is usually out so that more beach is exposed. However, there is very little shade on Nhat Beach, and it is increasingly difficult to ignore the landfill on the opposite side of the road, which is yet another reminder about how fragile this island is. 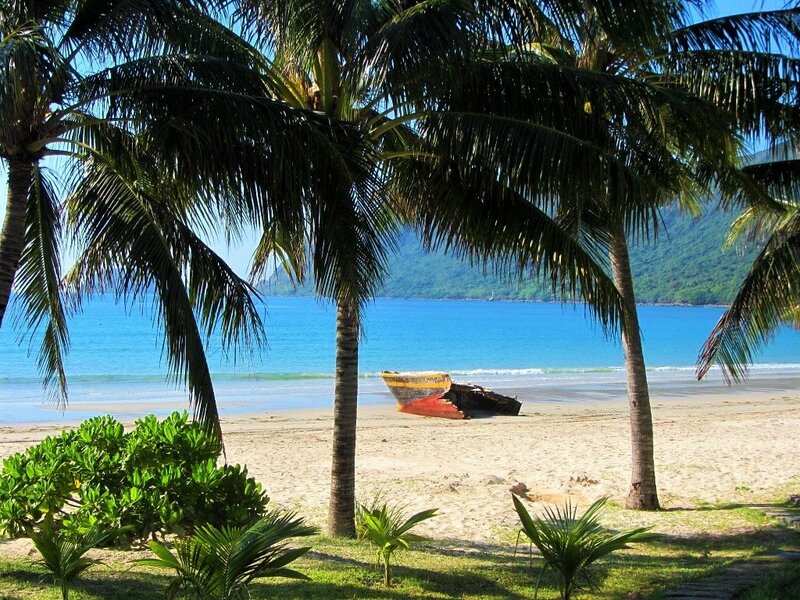 In the northwest of the island, Dam Trau Beach is a sandy cove shaded by casuarina trees and flanked by rocky headlands covered in tropical foliage. Just a couple of years ago, the beach was only accessible via a sandy dirt lane through the foliage. 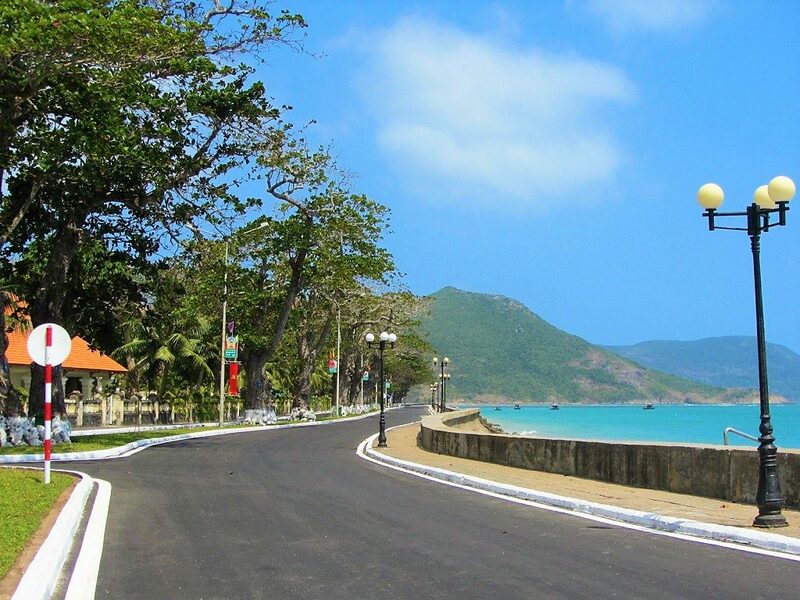 Now, however, a wide new paved road has been constructed, ultimately to facilitate development of the beach. For now, Dam Trau is still very quiet and peaceful for most of the day. But, in the late afternoons, tour buses often arrive (they can do so now because of the new road) and disgorge dozens of visitors. However, there’s lots of space so the beach is never crowded. Dam Trau is right next to the airport (the runway ends just as the tarmac meets the sand), so when the flights come in to land, everyone on the beach stops to gaze as the small propeller aircraft drift down over the sea. During the last couple years a few makeshift cafes have opened on the sand. They’re shabby and temporary-looking, and trash is piling up behind them, stewing in the sun. However, it’s nice to have some food and drink available on this side of the island, because previously the only place for refreshments was the airport cafe. A hundred metres before you reach the beach there’s a small shrine to Prince Cai, Phi Yen’s son. 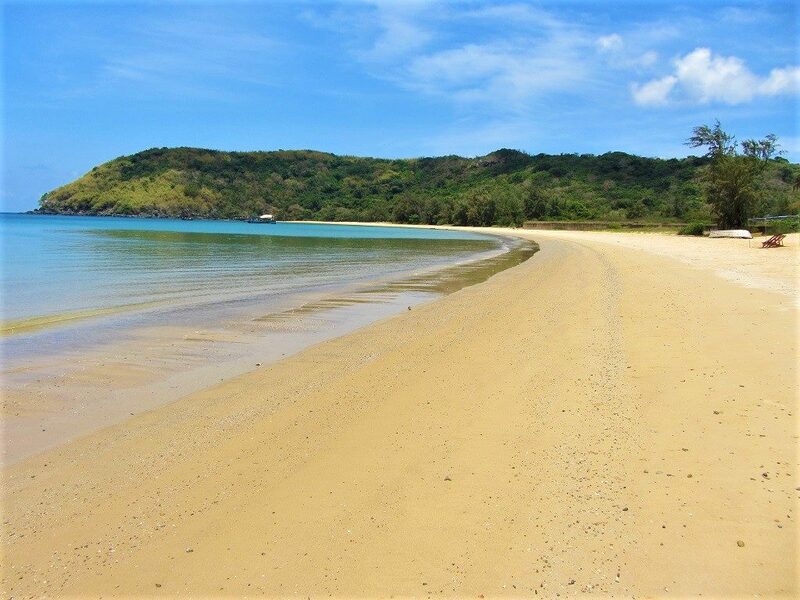 At the northeastern end of Con Son town’s fabulous seafront promenade, Loi Voi Beach is a ribbon of white sand spreading out under a line of casuarina trees. 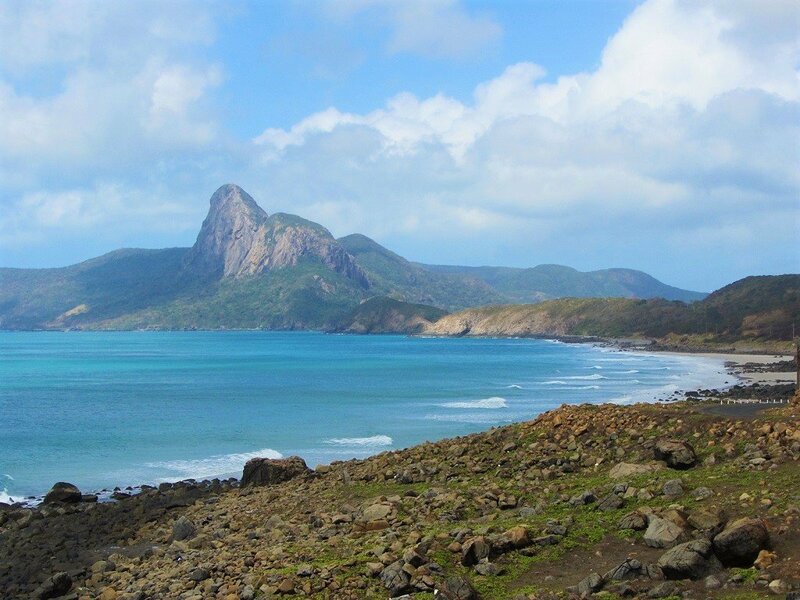 It’s a gorgeous spot: the water is shallow and blue, there’s a constant sea breeze drifting through the trees, the wooden skeletons of wrecked fishing vessels lie entombed in the sand, and the rugged hills of Shark Cape lead out into the ocean to south. The beach is protected and calm, sheltered by a hilly headland. At low-tide, usually early in the morning, the sand is exposed for over a hundred metres, during which time I’m told it’s possible to walk around the headland to a secret sandy cove at its tip. As always on Con Son Island, just as you’re wallowing in tranquility of Lo Voi Beach, you’re reminded that the past stalks every corner of this island. 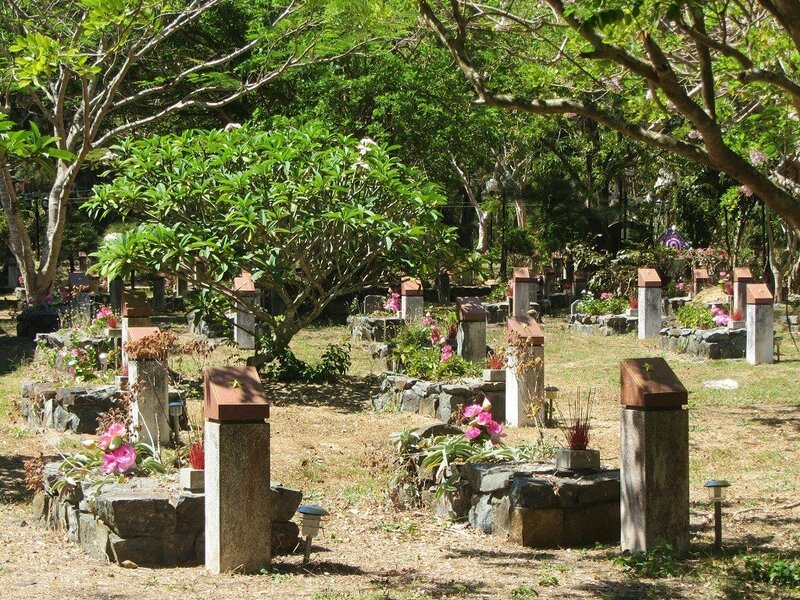 During the century that Con Son served as a prison island, many of the remains of the thousands of prisoners who died in captivity were discarded under the casuarina trees between the road and the beach. A memorial plaque by the roadside, covered in fresh flowers and burning incense, serves as a reminder. An Hai Beach is a sandy continuation of the harbourfront that stretches southwest of Con Son town. Fringed by palm trees and overlooked by green mountains, this beach is dotted with the only beachfront accommodation within walking distance of the town. However, even if you’re not staying at one of the beachfront resorts, you can still access this beach by walking or driving to the southernmost section of sand, where the road nearly meets the sea. The water here is clear and cool, and great for swimming. But sandflies have always been a problem and, now that the new boat pier has been constructed at its northern end, there’s a lot more trash in the water and washed up on the sand (much of it, sadly, comes from the fishing boats moored along the pier, whose crews tend to throw their beer cans and polystyrene boxes of food straight into the sea). However, the broad stretch of sand is such a beautiful sight that you soon forget about the flies and the litter…..well, almost. Another popular place to access what is, I suppose, technically Con Son Beach is either side of the smaller, old boat pier, directly opposite the old French customs house, in the centre of Con Son town’s seafront promenade. An hour or so before sunset, dozens of Vietnamese tourists and locals come out to play in the surf. It’s a great time to be here: watching the sun set behind Shark Cape, having a drink and snack from one of the street vendors, before walking back along the silent coast road, looking out at the anthracite ocean pricked with the glow of fishing boat lights. Although the vast majority of the sand at the western end of Dat Doc Beach is now owned (and conspicuously guarded) by the ultra-luxurious Six Senses Resort, the wider bay is just as appealing to swim, snorkel, wander, and find a large shady tree under which to camp for a few hours. The road runs very close to the coast, allowing you to park your motorbike on the verge and scramble down to a nice, isolated spot. At low-tide there are some sandy patches, but most of Dat Doc Bay is rocky. However, I find this is actually more convenient than sand: wet trunks out to dry in the sun on one boulder, picnic table on another, seats on others. I really enjoyed hopping from rock to rock along this bay in the late afternoon, when the sun sets over Con Son town. The views are dramatic and there’s no one around at all. The bay itself is protected from the winds and usually quite good for swimming. But if you swim be very careful not to go out too far, where the sea is exposed to the prevailing winds and the current can take you away. 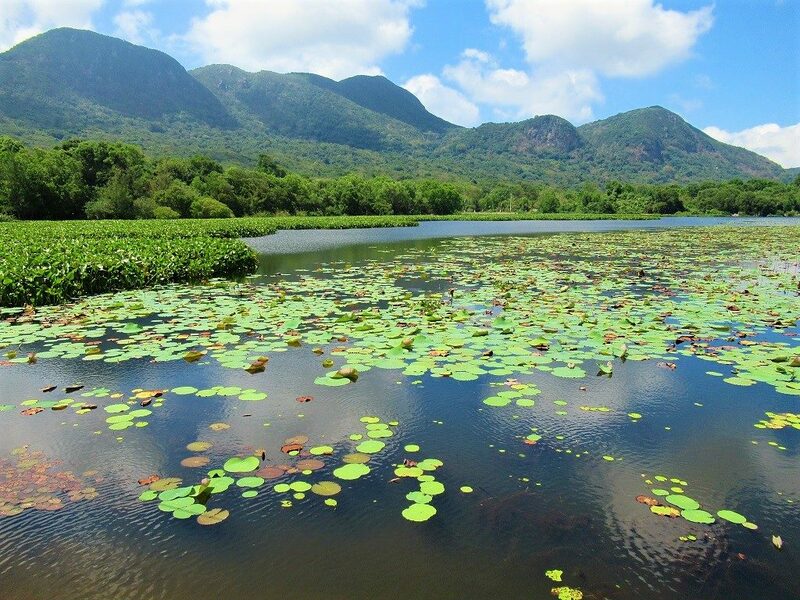 Only accessible via a beautiful hiking trail through thick jungle, Dam Tre is a lagoon right at the northern tip of Con Son Island. The trek takes a couple of hours and should be made in the mornings, when the tide is out, so that when you arrive at Dam Tre the water level will be low enough to get down to the lagoon and bathe. Swimming here is a real treat, especially after the hot and sweaty walk. The water is beautiful and there’s good snorkeling too. (Remember to bring drinking water.) It’s a gorgeous spot, and it’s easier than ever to get here, since the pathway has recently been cleared and widened (see Hiking for more details). 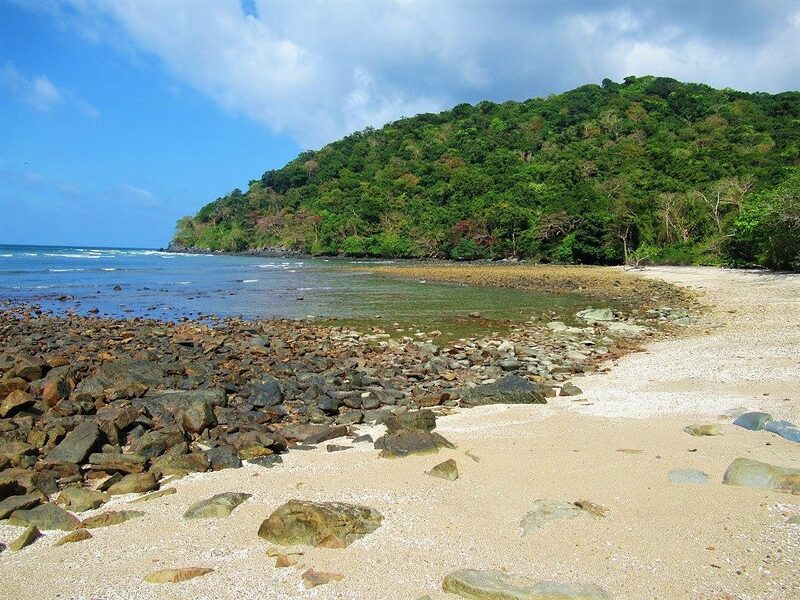 In the northeast of the island, Vong Beach is a wide arc of sand backed by dense jungle. Vong Beach is on the opposite side of the airport runway from Dam Trau. 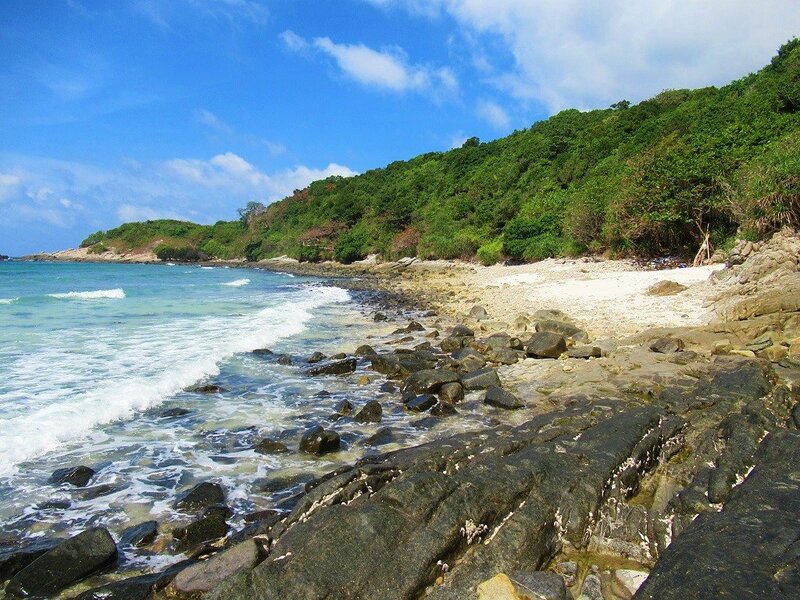 But, while Dam Trau is sheltered from the northeast winds, Vong Beach is quite exposed and can become rough during the northeast monsoon months (October to March). The seascape is very dramatic as the beach is bookended by steep, rocky cliffs. Vong Beach can be accessed via dirt paths that lead down from the coast road, but it’s easiest at the southern end where the road runs closest to the sea. 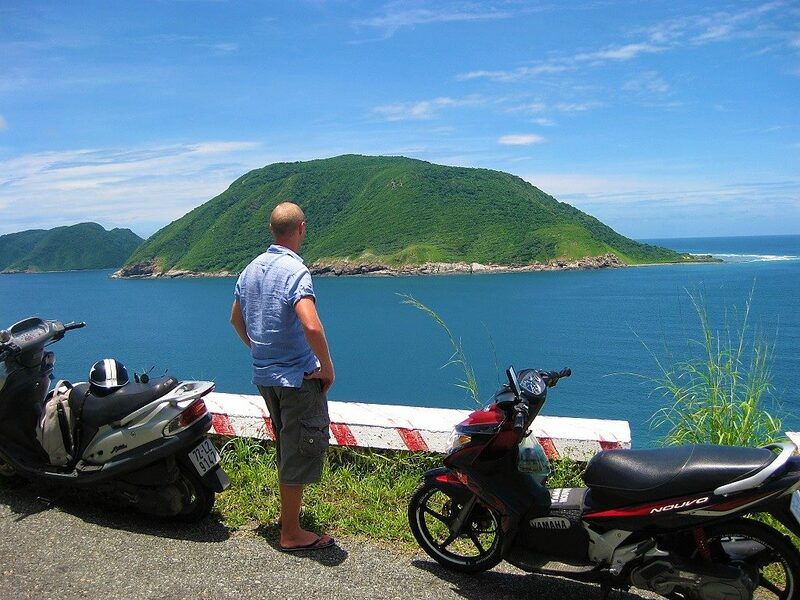 Renting a motorbike or scooter (available from most accommodations for 100,000vnd a day) gives you the freedom to really explore Con Son Island: choose your spot on any of the deserted beaches, go down sandy tracks leading into the jungle, and admire the spectacular views from the coast road that rings half of the island. In general, Vietnam is best seen on a motorbike, and Con Son Island is the perfect place to learn to ride if you don’t already know how. The well-maintained but empty roads give you all the space and time you need to get familiar with riding. You can easily ride all the island’s roads in one day, but take your time because riding here is such a pleasure. The total distance from Ben Dam Port (at the southern end) to Co Ong Airport (at the northern end) is just 25km. A new road on the island’s western coast is currently under construction and is scheduled to finish around 2020. However, be careful of strong winds as you round the two main capes on the island, and bear in mind that there are only a handful of gas stations on Con Son, all of which are marked on my map. 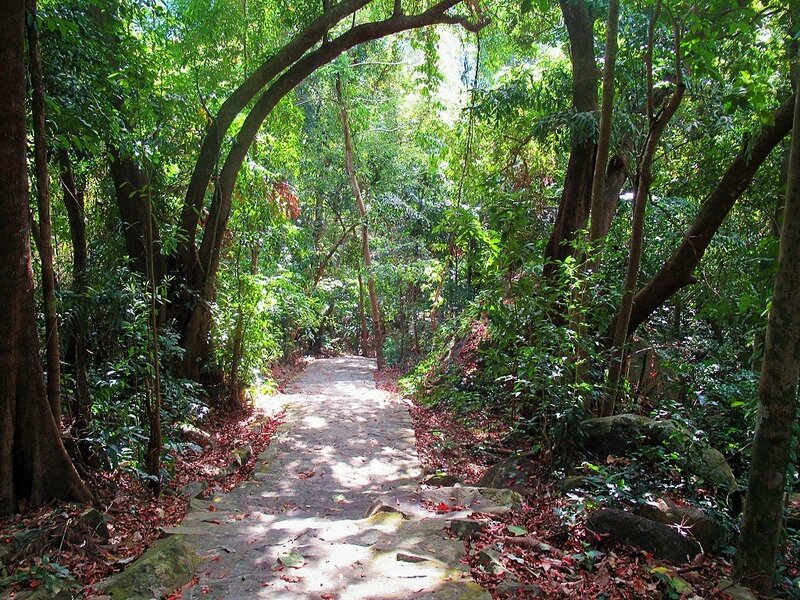 Aside from walking up and down the seafront promenade in the mornings and late afternoons (undoubtedly one of the highlights of visiting Con Son Island) and strolling along Con Son’s charming, languid back-streets, there are an increasing number of hikes around the island. 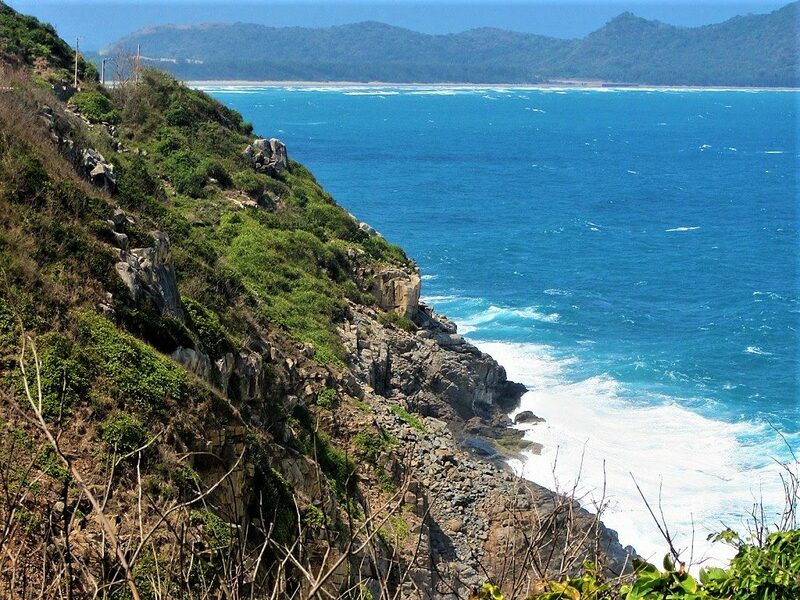 In the last couple of years, at least half a dozen hiking trails have been cleared through the forests and in the hills of Con Dao National Park, which covers most of the island of Con Son. The trails are easy-to-follow dirt paths or, in most cases, paved stone lanes. This is great news for walkers and there are many more trails being made. The scenery is excellent, there’s a high chance of seeing wildlife (such as macaques and black squirrels), and by walking it’s possible to reach parts of the island that are even more remote and that can’t be accessed by any other means. However, in the process of building these tracks, especially the paved ones, there has clearly been some damage to the natural setting through which they pass. On the other hand, there are trash cans at fairly regular intervals and notice boards about how to protect the environment and trek responsibly. Go the the new National Park headquarters, in the hills behind Con Son town, to pick up a map (not a particularly good one) with all the trails marked on it and to pay the park admission fee (60,000vnd). These days, all the hiking trails can be done independently: there’s no need for a guide and there are signposts along the way. To get to the trailheads you can walk or ride a motorbike or take a taxi. Remember to take plenty of water and a snack with you, because there’s little if anything on the trails themselves (and don’t forget your swimming things). The main cluster of trails is around the National Park HQ. One leads steeply down, via stone steps, to Ong Dung Beach (it’s really a rocky bay), another heads through the jungle to a grotto with a shrine to the Virgin Mary and then continues to Bang Beach, Hoai Duong Waterfall (only during the rainy season), and Dat Tham Beach. These are all very pretty, peaceful and worthwhile treks of medium strenuousness. Another trail is a loop from Ma Thien Lanh Bridge (near the park HQ) to So Ray fruit plantation and back down to the road. But the most scenic trek is from Vong Beach to Dam Tre Lagoon in the north of the island. The trailhead is at the southern end of Vong Beach. It’s best to begin this walk in the morning when the tide is usually out so that you will arrive at the gorgeous lagoon before the water fills it up completely. This is a longer trek and will take at least a few hours for the round trip. (On all of the trails, be careful in damp conditions, because the paths can become very slick). 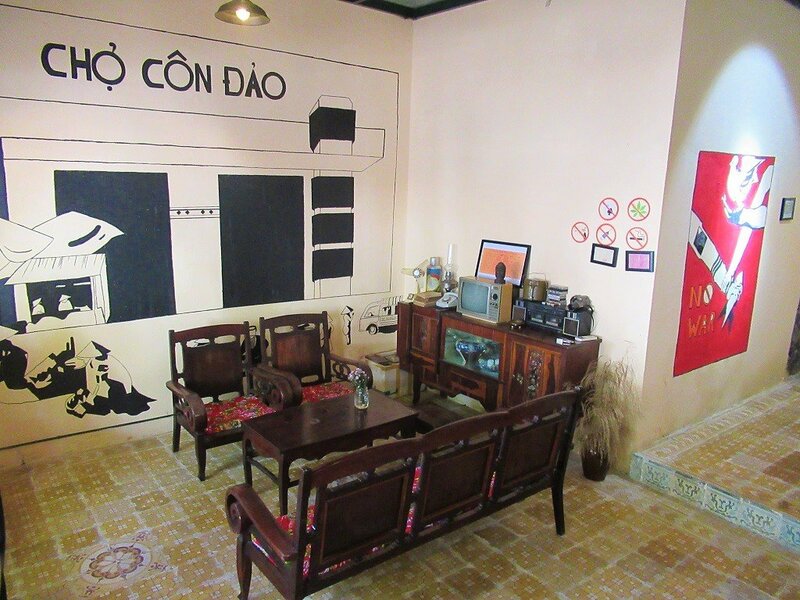 For the majority of Vietnamese visitors, it is Con Son’s history that brings them here. Every year, tens of thousands of Vietnamese of all ages and backgrounds come on a pilgrimage of sorts, to pay their respects to the former inmates of the prisons, many of whom are considered great national heroes. Over 20,000 prisoners died on the island, either through malnutrition, disease, mistreatment or execution. Of course, this makes the prisons and associated sites a very sombre experience. 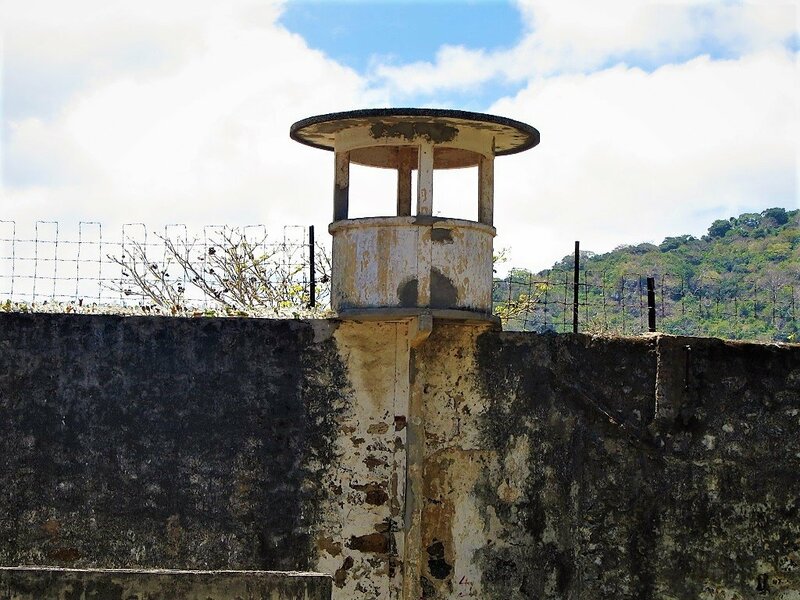 But, for a foreign visitor, it also gives you some historical perspective, and makes you appreciate how this island, which today appears to be the epitome of a tropical paradise, was a dark and hellish place for thousands of prisoners for over a century. There are several prisons on the island, all within walking distance of Con Son town. 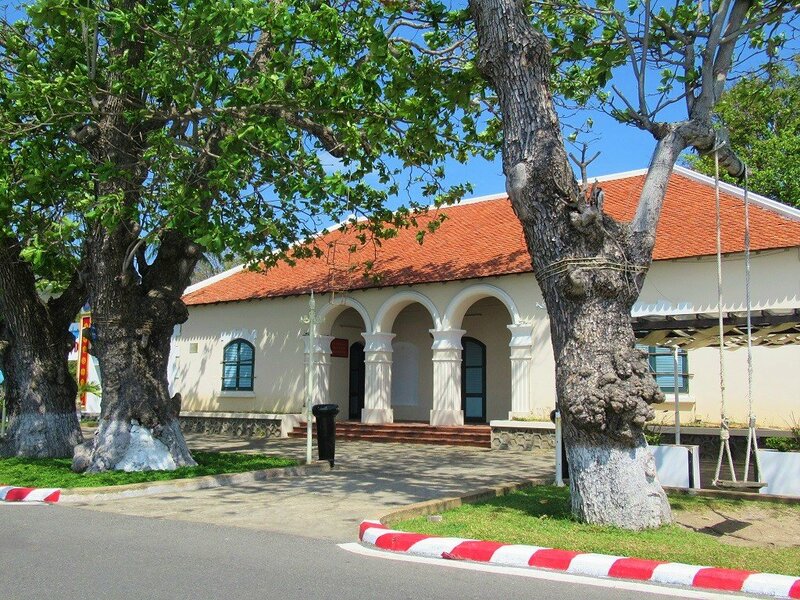 It makes sense to visit Phu Hai and Phu Son prisons first, where you can buy a ticket (60,000vnd) which covers entrance to all the other prisons and sites, including the museum. Strangely, the prison names in Vietnamese all translate rather romantically: Phu Hai (Rich Ocean) and Phu Son (Rich Mountain), for example. Some of the prisons are grey concrete blocks; others look less threatening: parts of Phu Hai and Phu Son resemble a French colonial seminary rather than a penitentiary. But, one look inside the cells – at the horrific, green, corpse-like mannequins – brings home the reality of conditions here. The most visited prison sites are Phu Hai, Phu Son and Phu Tuong. The latter is where the infamous ‘tiger cages’ are: small cells with grilles in the ceilings where guards poked prisoners with sticks and threw lime down on them, which burned their skin. Apart from the prisons, stone plaques around the town and across the island commemorate other horrific events in Con Son’s past, all related to the prisoners. The cowshed, for example, marks the mass grave where prisoners were massacred after a failed rebellion. The equally disturbing Con Dao Museum used to be held in the old Governor’s House on the seafront promenade, but relocated a few years ago to a sprawling new building on Nguyen Hue Street. They’ve fleshed-out the exhibits to fill the enormous new space, and information is now in English and Vietnamese (open: 7.30-11.00am and 1.30-5pm daily). There are photographs of some of the more famous of Con Son’s former inmates, including the likes of Pham Van Dong and Ton Duc Thang, who became long-serving prime minister and president of Vietnam respectively. There are also portraits of those who lost their lives on the islands, the most famous of whom was the 19 year-old, Vo Thi Sau. An independence activist from an early age, Vo Thi Sau was the first woman to be executed on the island. 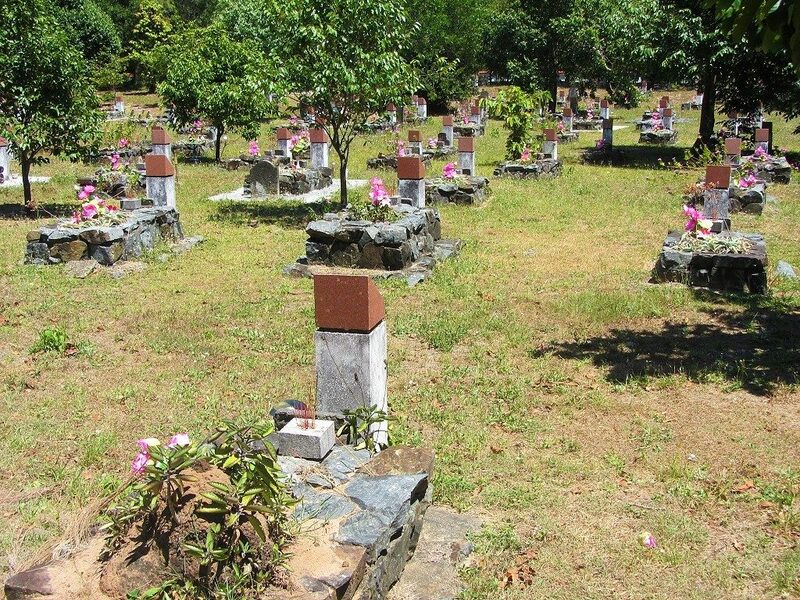 Her grave, and hundreds of others, can be visited at the sobering Hang Duong Cemetery, behind Con Son town on Nguyen An Ninh Street. Every night around midnight, a moving vigil is held at Vo Thi Sau’s tomb. Candles and incense are lit on her grave, and offerings of flowers, fruits, combs and mirrors (symbolizing her youth) are laid on her tomb. Foreign visitors are welcome, but make sure you dress (and act) respectfully (no shorts or bare arms). It’s a good idea to purchase some incense, flowers or fruit at the cemetery entrance (or in town) to lay at the grave. As with all regions of Vietnam, there are folktales and myths surrounding the Con Dao Islands, some of which are intertwined with historical events. The story of Phi Yen is the tale that dominates Con Dao mythology, and there are several shrines and temples commemorating it. There seem to be a few different versions of the story, but essentially it involves the emperor Nguyen Anh’s concubine, Phi Yen, being abandoned on the island to die as a result of her counseling the emperor not to seek French help in order to regain his power over the Vietnamese mainland. Phi Yen’s son, Prince Cai, was thrown into the sea and drowned. His body recovered and given burial on Con Son Island, Phi Yen spent her days grieving her son, eventually ending her own life by hanging. The historical events in this folktale happened in the late 18th century, when a successful rebellion swept through Vietnam, but was ultimately quashed by emperor Nguyen Anh with French aid, thus ushering in the beginnings of French involvement in Vietnamese affairs, culminating in the French colonization of Vietnam, which began in 1858 and lasted until 1954. Phi Yen’s temple (also known as An Son shrine) is a pretty and peaceful place on the edge of Con Son town, by a large lake of waterlilies. In the shade of a giant flame tree, the temple is short and stocky with a cool and breezy courtyard. Buy some incense and take a few moments to contemplate Phi Yen’s sad tale. 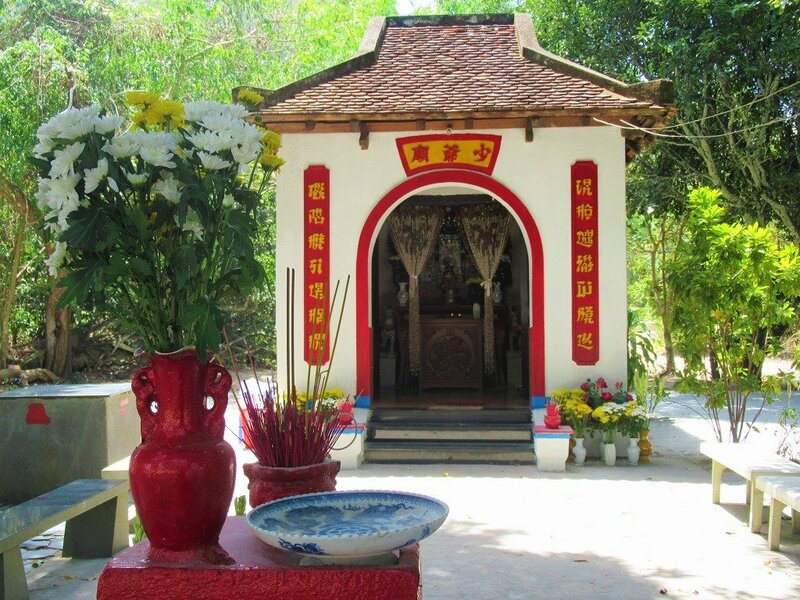 On the other side of the island, there’s a shrine to Prince Cai on the road to Dam Trau Beach. Guarded by two sculpted horses, this is also the tomb of the prince, whose grave is behind the shrine. The newly refurbished pagoda complex of Van Son (Cloud Mountain) sits in a commanding position on the hillside above An Hai Lake. It’s a steep (and hot) climb up the stairs to the prayer rooms. There are good views from the top out to sea and across the town. An impressive new temple dedicated to the men and women who were imprisoned and lost their lives on Con Son Island sits at the entrance to Hang Duong Cemetery. 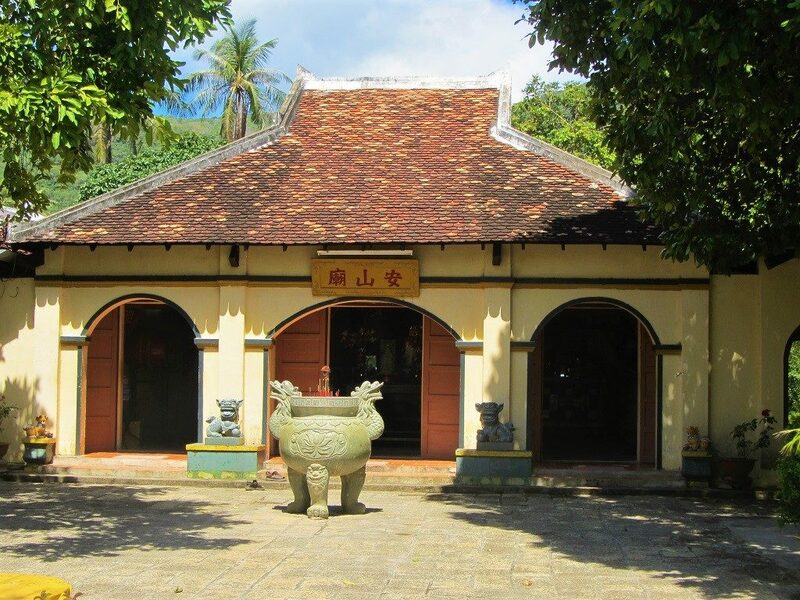 And, at the northern end of the seafront promenade, a small, attractive temple to Vo Thi Sau stands in a tidy park, but was empty at my last visit. Boat trips to the outlying islands can be arranged through some of the hotels, the National Park headquarters, and (if there’s anyone there) the tourist office at the new boat pier. 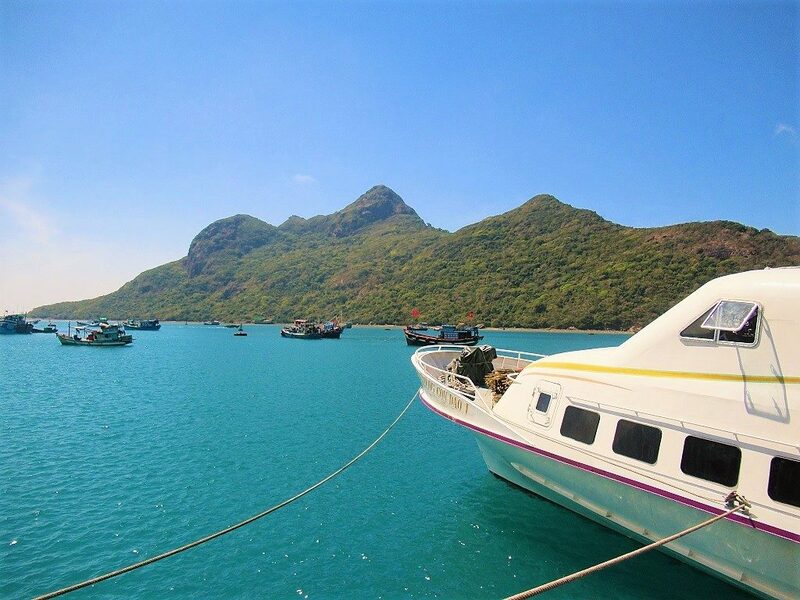 A boat ride to Bay Canh Island (the second largest in the archipelago) is the most popular trip. Prices are fairly high so you’ll want to go as a group in order to share the costs (usually around 1,500,000vnd). 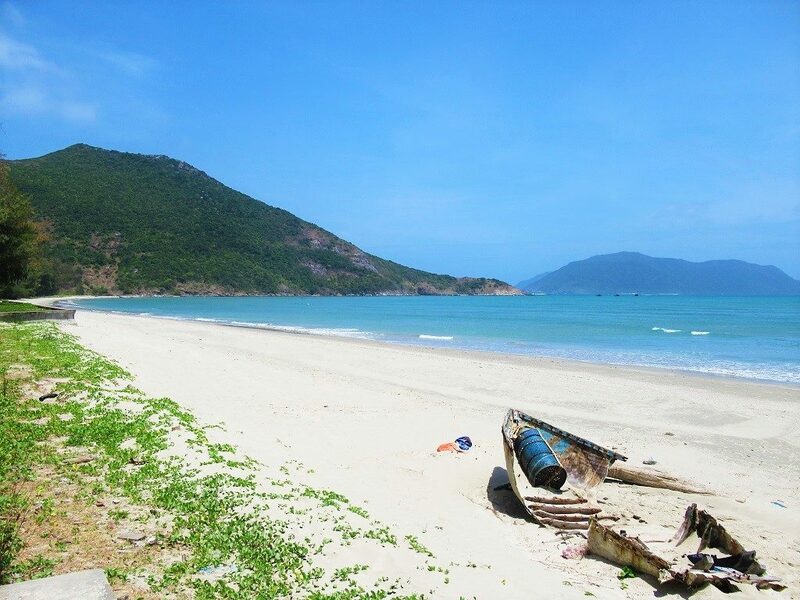 Con Dao is well-known for its sea turtle nesting grounds. It’s possible to book a tour through the National Park HQ to witness the laying of the eggs on the beaches at night (packages start from around 1,00,000vnd per person). The season lasts from June to September, but there are serious concerns over the National Park’s management of the sea turtles and their eggs, including accusations of making personal profit from selling the turtles’ eggs and shells. This has led to calls for visitors to boycott these trips as a demonstration against these practices. Con Dao Market is a bustling little place that’s great fun to explore, particularly in the early mornings and late afternoons, when it’s at its busiest. The market is currently being expanded and will soon occupy a large new building, as well as its present, Soviet-looking one. For the time being, the main market is under a temporary roof (called cho tam) opposite the original market. There’s plenty of local fruit, vegetables and fish for sale, as well as some cooked food (such as noodle soups) in the mornings. The fish section is surprisingly underwhelming, probably because a lot of Con Dao’s catch gets exported to restaurants on the mainland. However, you can still see fresh lobster and even the occasional shark. An interesting Con Dao gift shop opened a couple of years ago on Nguyen An Ninh Street. This smart and clean souvenir store includes island specialities, such as bags of tropical almonds (hat bang) that area grown on the enormous old trees lining the town’s streets, local liquor made from ginseng (ruou sam), and fresh honey (mat ong) among other treats. It’s definitely worth a look. 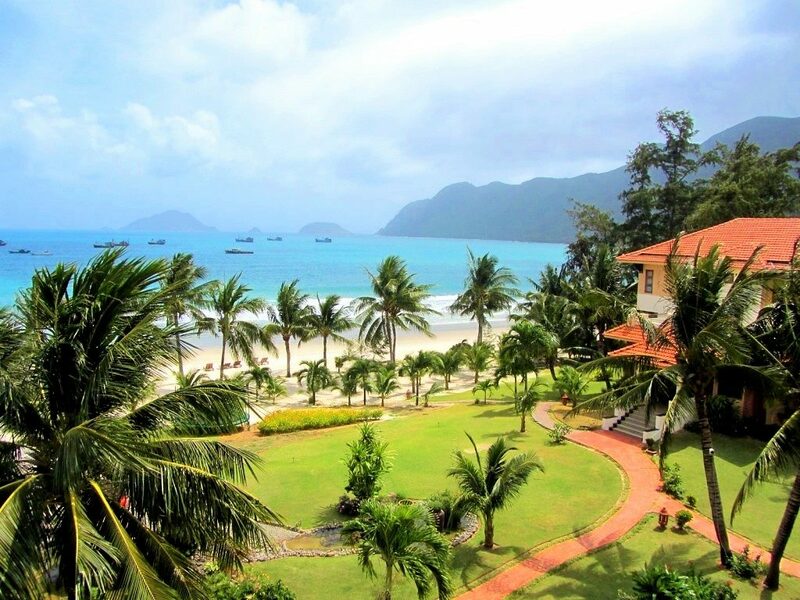 The number of places to stay on the Con Dao Islands has grown significantly over the last couple of years. 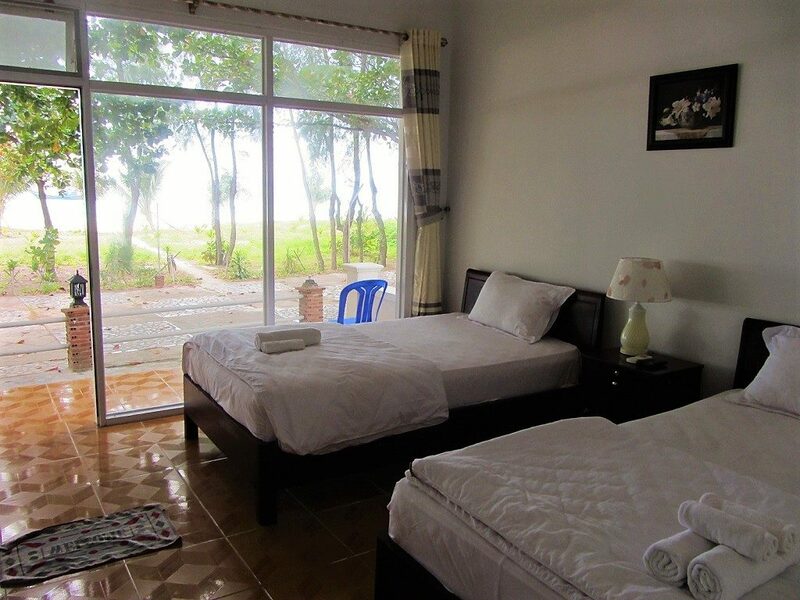 There are now dozens of mini-hotels in Con Son town, all offering good budget-standard rooms, albeit at mid-range prices. There’s a clutch of mid-range hotels along the town’s seafront, and two very high standard luxury resorts. 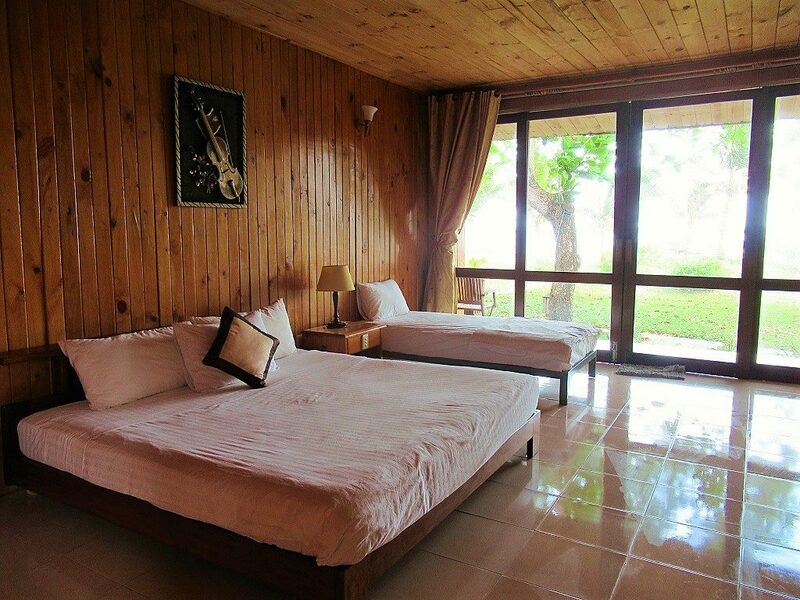 However, as with all expenses on the Con Dao, room prices are relatively high, and value for money isn’t great. In general, expect to pay at least 30% more than you would on the mainland. But, I think 3-4 days on the islands is well worth the extra cash you’ll spend. All accommodation is on the main island of Con Son. The following hotels in each category are listed in order of my own personal preference. • Six Senses Con Dao [MAP]; $400-$2,000; [BOOK HERE] The Six Senses brand has a reputation for atmospheric resorts in superb natural surroundings throughout Southeast Asia, and this one received a lot of media attention in 2011, when ‘Brangelina’ stayed here. The resort consists of contemporary-looking private villas made entirely of wood, built along a lovely, long stretch of sand on Dat Doc Beach. The villas are pretty low-impact (you can hardly see them from the road), very well-made, and all of them have ocean views and private plunge pools, as well as other smart little touches, such as in-room espresso machines. Service is exceptional: staff are incredibly well-trained and very friendly. Mid-range hotels and resorts on Con Son Island are around $20-$30 above their ‘real’ value: i.e. what you’d expect to pay if they were on the mainland. But it’s worth it for the location: all of the following mid-range accommodations are either on the beach, on the seafront promenade, or on the shady backstreets of Con Son town. • Former ATC Resort [MAP]; With a string of converted 1930s French villas along the seafront promenade, the former ATC Resort is currently under renovation. One hopes that its future incarnation will preserve the colonial-era buildings on its land, and resist the temptation to build a multi-storey monstrosity. It’s a large and beautiful piece of land, at the northern end of the seafront road, with marvellous vistas across Con Son Bay. At the time of writing (April 2018) they were a long way from reopening. As with the mid-range places, expect to pay around $10 dollars a night more than you’re used to for budget accommodation on Con Son Island. In fact, the budget price bracket here is between $20-$40. 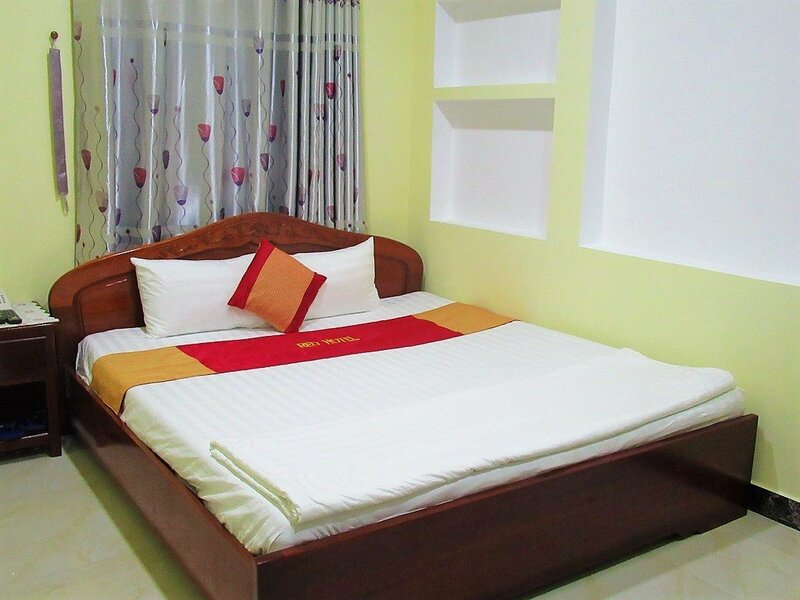 However, when you’re sharing the cost with at least one other person, value for money is pretty decent, especially considering that the standard of all the new mini-hotels in Con Son town is quite high. 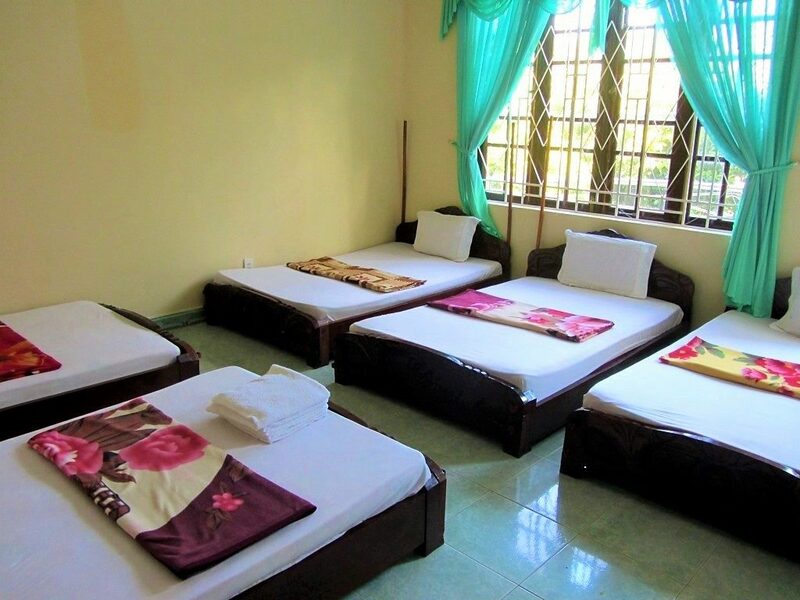 Hai Nga Mini Hotel [MAP]; $15-$25 | Tel: 064 363 0308: Basic but clean, the larger rooms sleep up to 7 people, so they are good value for a group of budget travellers. Anh Dao Hotel [MAP]; $20-$30; [BOOK HERE] A well-run guesthouse with spotless rooms on a quiet street. Thuy Thanh Hotel [MAP]; $25-$35; [BOOK HERE] Spacious, clean and comfortable rooms in a bustling (for Con Son) area near the market. 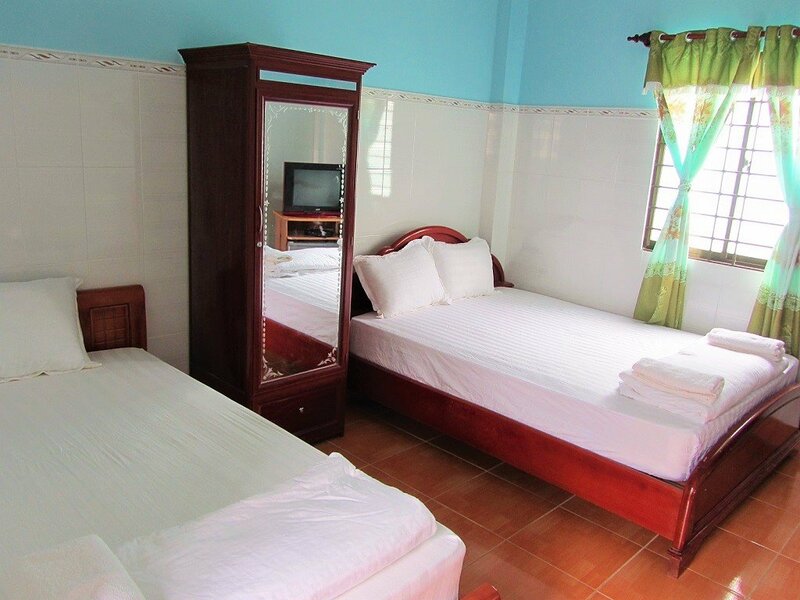 Con Dao Guest House [MAP]; $25-$35; [BOOK HERE] Government-run guest house (nhà khách) with plain but clean rooms in a quiet location. Caters mainly to Vietnamese officials and tour groups, but foreign guests are welcome. 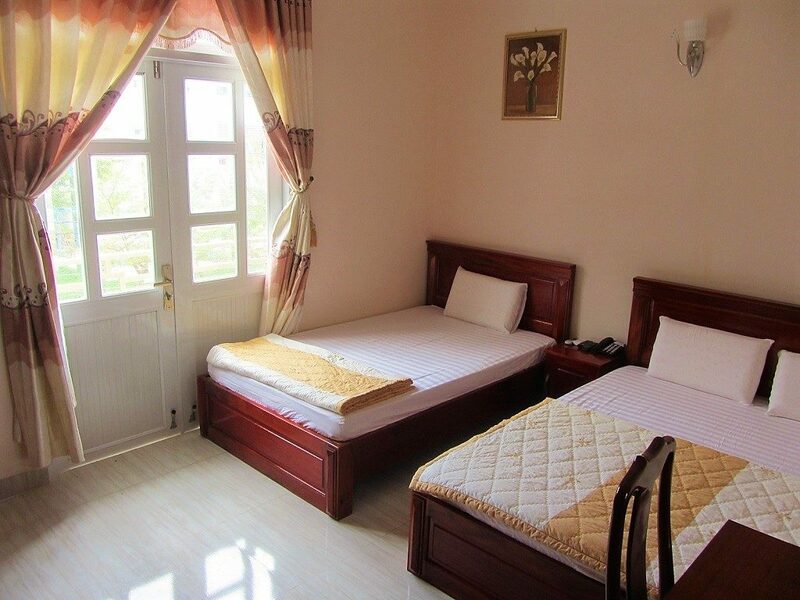 Duc Thanh Motel [MAP]; $20-$30; 0919 250 931: Good, new mini-hotel right by the market. Only a few rooms. Sala Motel [MAP]; $25-$35; [BOOK HERE] A good budget option with plain but clean rooms. The seafront promenade is right in front of it. Con Son Island Hotel [MAP]; $20-$30; [BOOK HERE] A great location at the beginning of the seafront promenade, rooms are comfortable and clean without many frills. Thanh Xuan & Thanh Ngoc hotels [MAP]; $20-$30; 0169 246 2751/0918 429 258: Decent budget options on the seafront promenade, although some rooms are dark and a bit run-down. CAMPING: Camping is possible on Dam Trau Beach in the north of the island, although it’s not really an official setup. If you ask at Làng Đầm Trầu on the beach, they will let you pitch your tent (if you have one) on the sand and use their bathroom facilities. However, they don’t have the authority to let foreign guests stay here, so there’s a slim chance you’ll get moved on if an official comes to inspect. This is the case for ‘wild camping’ everywhere on the island. Most of Con Son Island is part of the national park, so it’s a protected area. Whether camping inland or on a beach there’s always the possibility that, if someone sees you, you’ll be asked to leave. This has happened to me on a couple of occasions, although I’ve been able to camp undisturbed several times too. The food scene on Con Son Island has really improved over the last two years, although it’s still nowhere near as rich and diverse as mainland Vietnam. As the population of Con Son town has grown (thanks to settlers moving here from the mainland), street food vendors have started to pop up, catering to the different palates of a population that now hails from all over Vietnam. There’s also a handful of good seafood restaurants, which cater largely to Vietnamese visitors from big urban centres, eager for some fresh food from the ocean. And, as foreign travellers continue to trickle in, a few places now serve good Western food, not to mention the restaurants attached to the mid and high-end resorts. What’s more, Con Son now has a growing cafe culture and even a few bars. Con Dao Market Food Vendors [MAP]; 10,000-30,000vnd ($1-$2): Hiding all sorts of delicious breakfast dishes, the food court inside Con Dao Market is a hive of food and activity from around 6.30-9am each morning. It’s a great place to fill up in the mornings, especially if you’re staying at one of the cheaper accommodations that don’t include breakfast. About a dozens vendors dish out classic Vietnamese noodle soups and drinks. 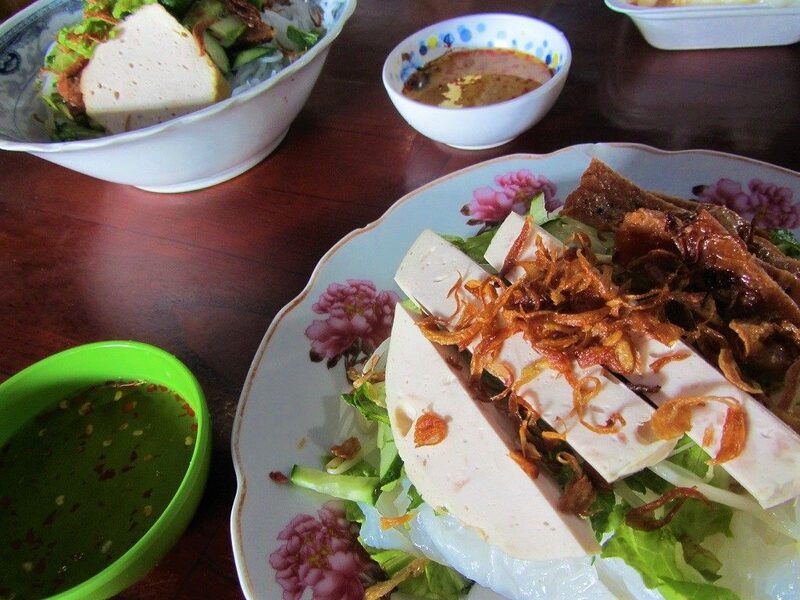 Try the bún thịt nướng (a cold noodle salad with grilled lemongrass-scented meat). It’s dirt cheap, very local, and delicious. The earlier you get here the better. The market is also a good place to buy ingredients for a picnic to keep you going during the day while you’re exploring the island. There’s a decent bánh mì (baguette) stall just as you enter the market food court, where you can buy filled baguettes to take with you as picnic food. Nhat Kieu Hu Tieu Noodles [MAP]; 30,000vnd ($1): Not far from the market, Nhat Kieu is a noodle joint that could be straight from the mainland. Specializing in hủ tiếu nam vang (Cambodia-style rice vermicelli noodle soup), Nhat Kieu is an open-side noodle house on a street corner with low tables and chairs. 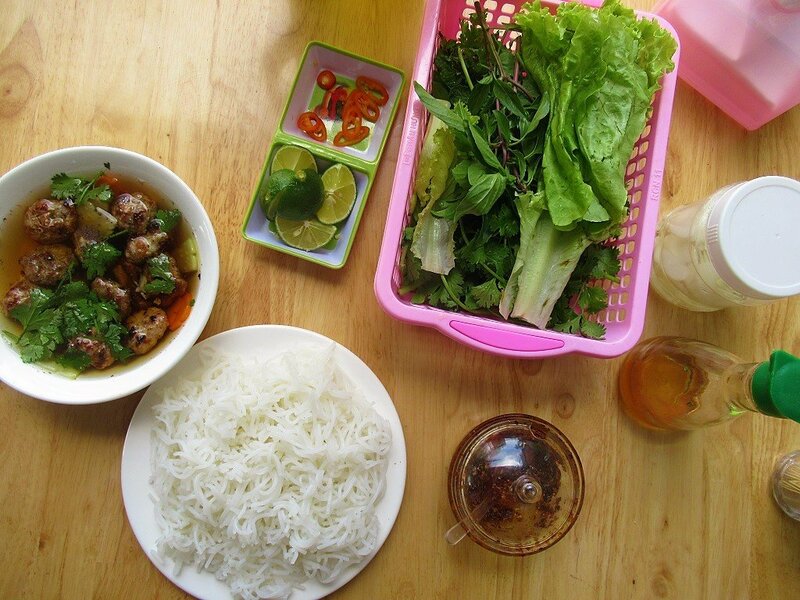 It’s informal and cheap, and a classic southern Vietnamese breakfast. Pham Van Dong Park Street Food [MAP]; 10,000-30,000vnd ($1-$2) In the late afternoon, several good places set up stalls on the eastern edge of Pham Van Dong Park (which, incidentally, used to be the French colonial cemetery until just a few years ago). 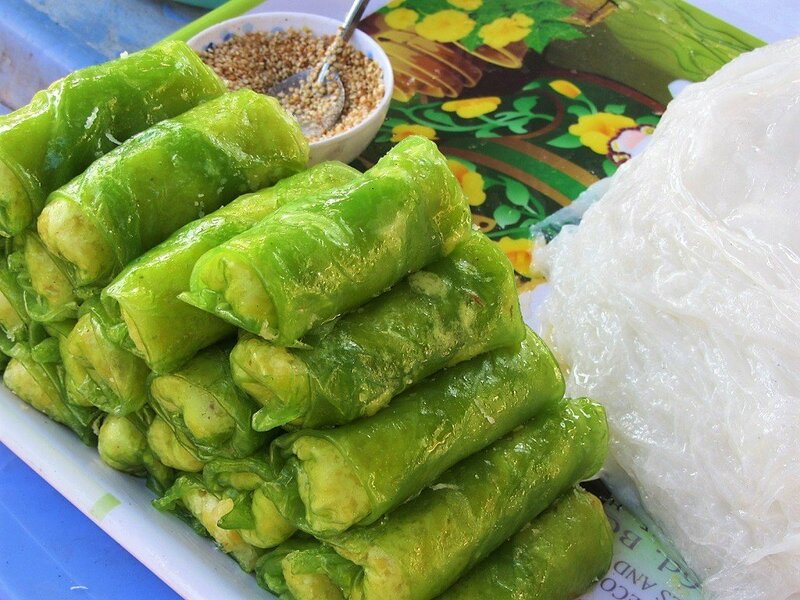 At around 5pm, when the light is low and the temperature cool, the street food vendors begin to serve up bánh xèo (fried savoury pancakes) and gỏi cuốn (fresh spring rolls) among other dishes. It’s very cheap, light, fresh, and crisp food: perfect for a snack to tide you over until dinner. Bun Cha & Pho Noodles [MAP]; 30,000vnd ($1-$2) Right next to the Q Songchi mini-hotel, this is a classic streetside place serving up the Hanoi speciality bún chả (rice noodles and grilled marinated pork patties with a sweet and sour dipping sauce). It’s run by northerners, so this is about as close as you can get to the real thing considering Con Dao is almost as far away from Hanoi as you can get in Vietnam. Come here for breakfast. Binh Nguyen Shellfish Eatery [MAP]; 30,000-80,000vnd ($1-$4) per dish Offering up all sorts of shells – snails, clams, oysters, scallops, cockles – Binh Nguyen is a streetside quán ốc (shellfish and beer eatery). Attracting a youngish crowd of domestic travellers, Nguyen Binh serves fresh and reasonably priced shells. There are dozens of them to choose from, all cooked in different ways with different sauces (for more about how to order and what to eat at a shellfish eatery like this, take a look at my Shells Guide). This is a good substitute for the higher-priced seafood restaurants. Nhỏ Ơi Rice Eatery [MAP]; 20,000-60,000vnd ($1-$3) An informal rice eatery of the type you find all over Vietnam, Nhỏ Ơi is a little place where you point at what you want over your rice. There’s a wide selection of dishes, from sauteed vegetables to fish stew, grilled pork cutlets to sweet and sour soup. It’s pleasant, cheap, friendly, and very local. There’s also a string of similar local rice eateries along the slip road on the north side of Nguyen Hue boulevard, which are good for cheap lunches. Nem Chạo Giò Heo Rút Xương & Grilled Chicken [MAP]; 30,000vnd ($1) Opposite the temporary market (Chợ Tạm) on Pham Van Dong Street, are a couple of places selling nem chạo giò heo rút xương (a delicious arrangement of pork, herbs, and peanuts wrapped in rice paper). Also in this area, a couple of streetside barbecues tempt passersby with grilled meats (chicken, pork, duck, quail) rotating over coals. Streetfood on Nguyen An Ninh Street [MAP]; 25,000vnd ($1) Opposite the park, several small streetfood eateries line Nguyen An Ninh Street. Ranging from bánh bèo (mini rice flour savoury cakes) to bánh tráng (crispy little grilled ‘pizzas’), these cater to Con Dao locals in need of a snack in the late afternoon. It’s worth dropping by to have a bite. Thu Tam Mini-Mart [MAP]; The go-to shop on Con Son Island for snacks, such as yogurt, biscuits, soda etc, Thu Tam is as close as you get to a mini-mart. It’s pretty good for stocking up on supplies for a hike. There are one or two other mini-marts around town now, too. Thanh Huyen Restaurant [MAP]; 100,000-200,000vnd ($4-$9) per meal My favourite restaurant for food and atmosphere, Thanh Huyen is 5 minutes out of town by motorbike, on the left after crossing the lake. A big ‘Bia Saigon’ sign marks the entrance: drive down the dirt track and over a rickety wooden bridge until you see a few shacks over a pond. It might not promise much from its ramshackle entrance, but once you settle down in one of the makeshift ‘gazebos’ clustered around ponds, paddies and herb gardens, you’ll start to appreciate the ambience here. 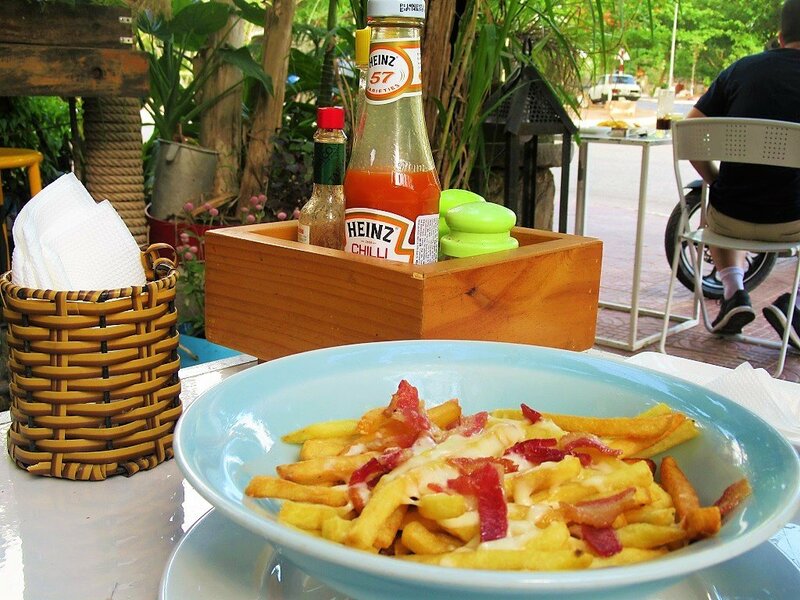 The menu is short and exotic, and the food is fresh and delicious. 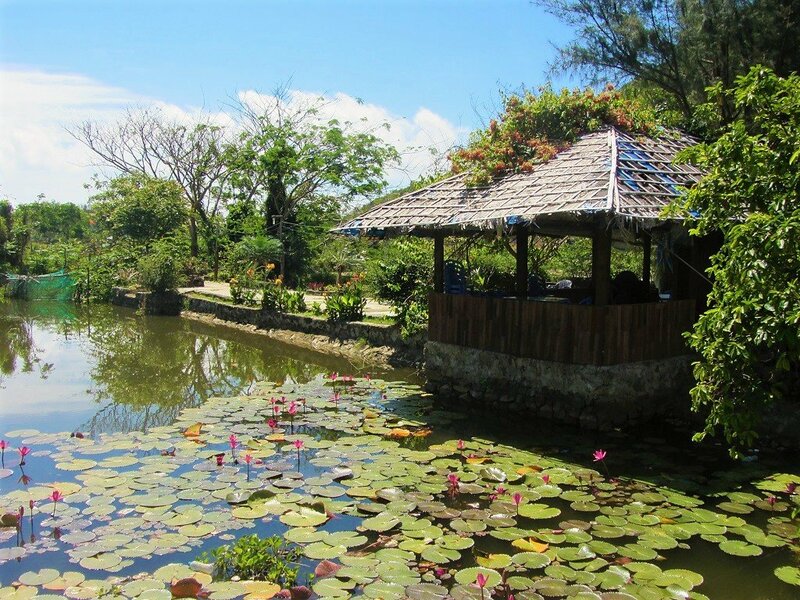 Try chicken with kaffir lime leaf (gà luộc lá chanh), or buffalo hotpot (lẩu trâu), or grilled snakehead fish (cá lóc nướng), surrounded by the restaurant’s herb garden, the placid lotus lake, and the proprietor’s children competing with the cicadas and frogs for audio supremacy. There’s now an English menu, but some of the translations can be hard to understand. It’s especially nice to arrive just before dusk while there’s still some light left to enjoy the surroundings. Bring bug spray so as not to let the mosquitoes ruin a great meal. Seafood Restaurants: Ớt, Tri Kỷ, Cánh Buồn, & Thu Tâm [MAP]; 100,000-500,000vnd ($4-$22) per kilo This string of seafood restaurants lines the inland side of Nguyen Duc Thuan Street. Specializing in all things from the sea – from crustaceans to mollusks to giant fish – each of these restaurants has long menus and tanks of live seafood. This is the place to come for a seafood banquet. The food is good and fresh (although not quite as good as I’d expect considering their proximity to the ocean, and prices are much higher than on the mainland.) However, portions are large and, on my last visit, there were signs that quality is catching up to mainland standards. What’s more, most of the restaurants have undergone major renovations recently: they’re now nice places to sit, eat, and talk for a long evening. 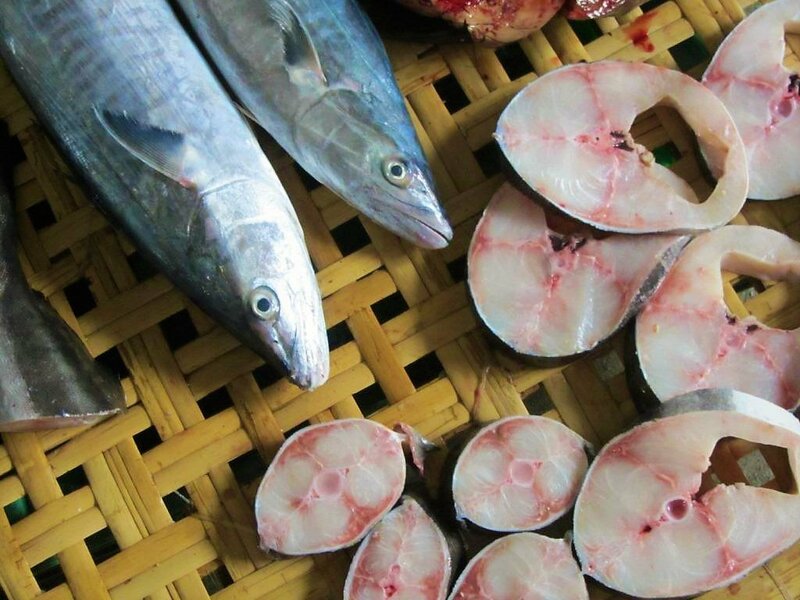 Be prepared to open your wallet if you really want to dine on the biggest, freshest fish here. Ớt is marginally my favourite of the four. Thu Ba Seafood Restaurant [MAP]; 60,000-500,000vnd ($3-$22) Away from the other seafood restaurants mentioned above, Thu Ba is in Con Son town, not far from the market. 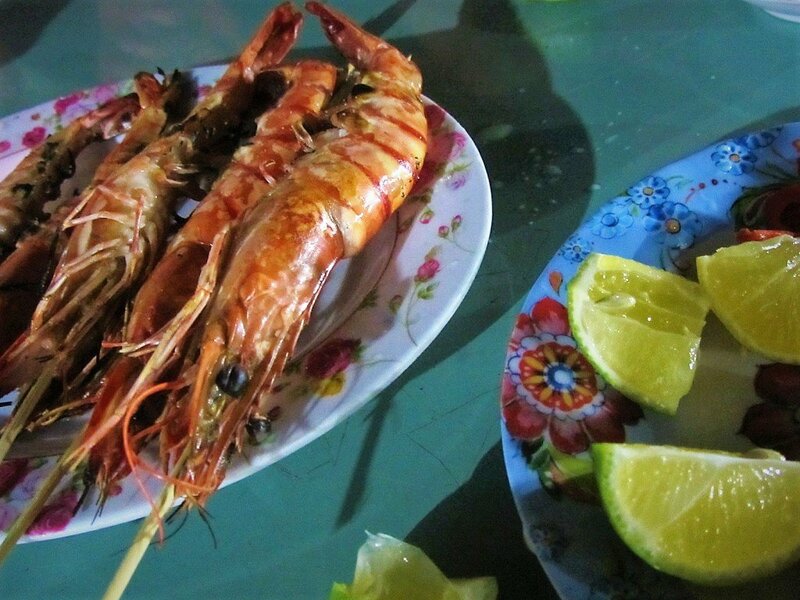 A popular place for international travellers to feast on seafood, Thu Ba is a foreigner-friendly restaurant with an English-language menu listing its extensive range of fish, shellfish, and classic Vietnamese dishes. This is good place to start your Con Dao dining exploration, especially if you’re not ready to try more local establishments. Infiniti Cafe [MAP]; 50,000-150,000vnd ($2-$6) Not only is this one of the most popular cafes on the island (see below), it also serves very good Western-style dishes, like homemade pizzas, pasta, steak, set breakfasts, and comfort foods such as cheesy fries. 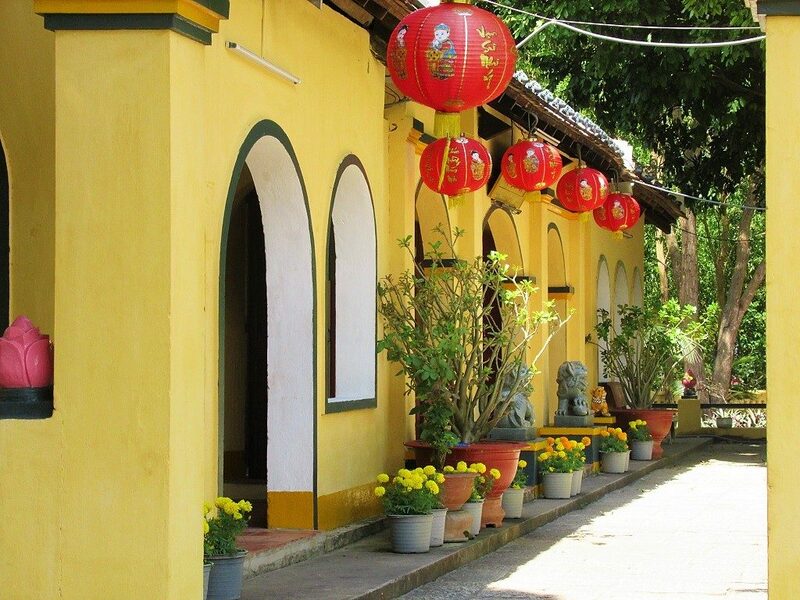 Undoubtedly one of the ‘trendiest’ places on the island and a good place to meet other travellers and Con Dao expats. As a rule, everyone likes Infiniti Cafe. Dê Lang Thang & Tre Con Son [MAP]; 100,000-200,000vnd ($4-$9) Two new restaurants right next to each other on Vo Thi Sau Street, both these places are hoping to succeed where others have failed on exactly the same plot of land over the years. 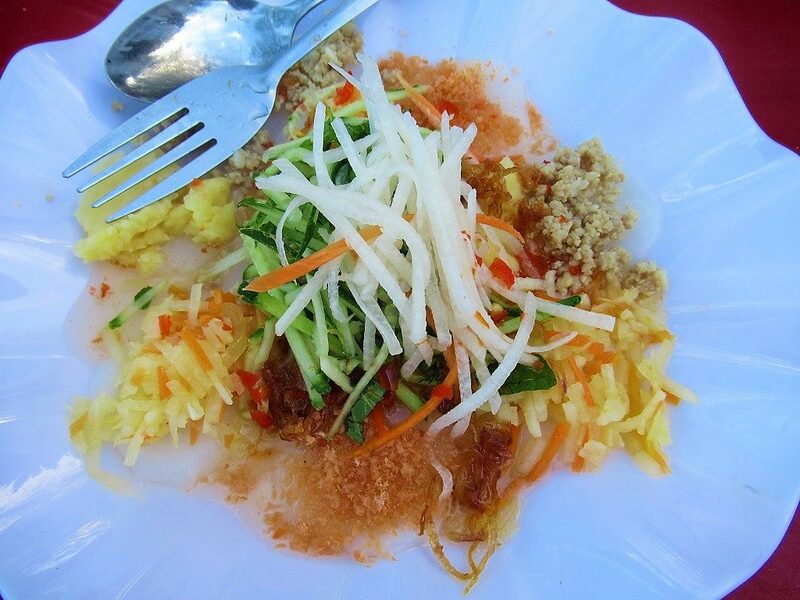 Dê Lang Thang specializes in local goat meat dishes (thịt dê). In general, Vietnam does goat extremely well, so it’s definitely worth popping in here one night and ordering a few dishes: try the cà ri dê (goat coconut curry) and the dê hấp tía tô (steamed goat with lemongrass and perilla leaf, if they have it). Next door, Tre Con Son focuses on another Con Dao speciality, chicken. This particularly variety of chicken (gà tre) is quite small, lean, and a bit chewy. It comes grilled or steamed or boiled with many marinades to choose from. Villa Maison [MAP]; 100,000-200,000vnd ($4-$9) In a marvellous, open-sided French-colonial villa, the restaurant at Villa Maison is very atmospheric. The owners try to source as much as possible from the local area and focus of regional dishes, but there are also some European treats, such as cheeses and cold cuts. Food (and wine) is good, but it’s the dining ambience that makes the meal memorable. It’s also a good place for a drink (see below). Six Senses [MAP] & Poulo Condor [MAP]; 200,000-1,000,000vnd ($10-$50) The restaurants at the two most luxurious resorts on the island are both good if you feel the need for a slap-up meal. Six Senses is the better of the two, but Poulo Condor is more affordable. However, you can’t really just drop by for lunch or dinner at either of them: you’ll need to call ahead for a reservation or ask at reception before entering. There are various reasons for this, but I feel it makes the process a bit of a hassle, and in my experience it’s not really worth the effort, especially now that the food scene in Con Son town is growing. 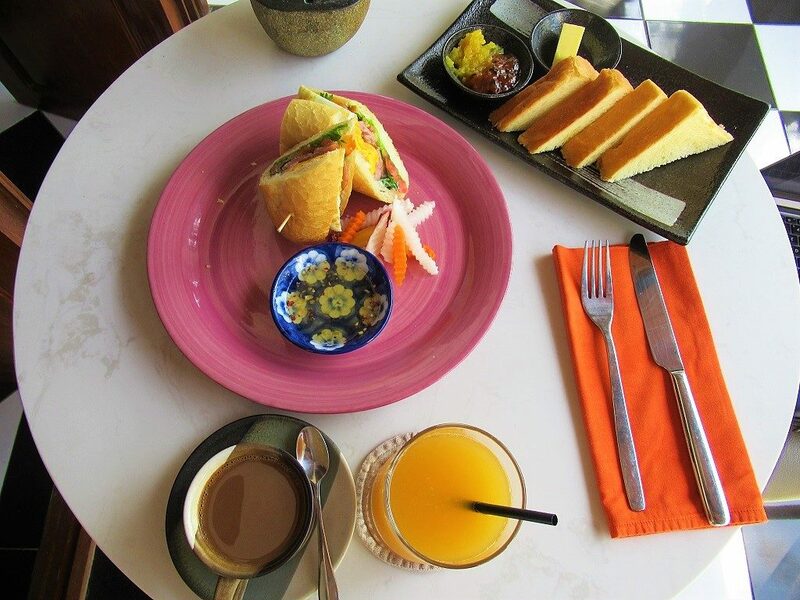 A good variety of Vietnamese, Asian and European dishes are served at both. Coco Restaurant (Con Dao Resort) [MAP] & Poulo Condore Restaurant (Saigon Con Dao Resort) [MAP]; 80,000-200,000vnd ($3-$10) These two restaurants at two of the best mid-range resorts on the island both serve good Vietnamese fare. 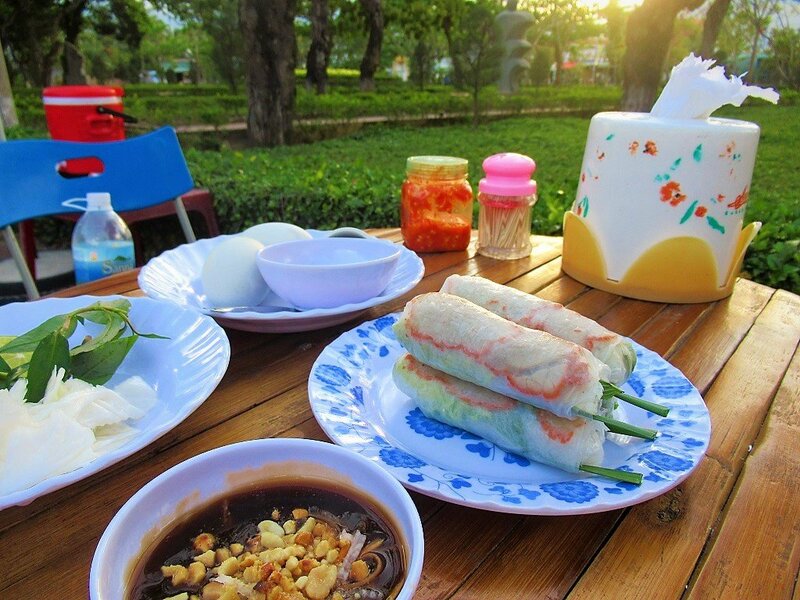 This is because both these accommodations tend to attract a mainly Vietnamese crowd, and Vietnamese travelling groups are usually quite discerning about the quality of the food they eat. 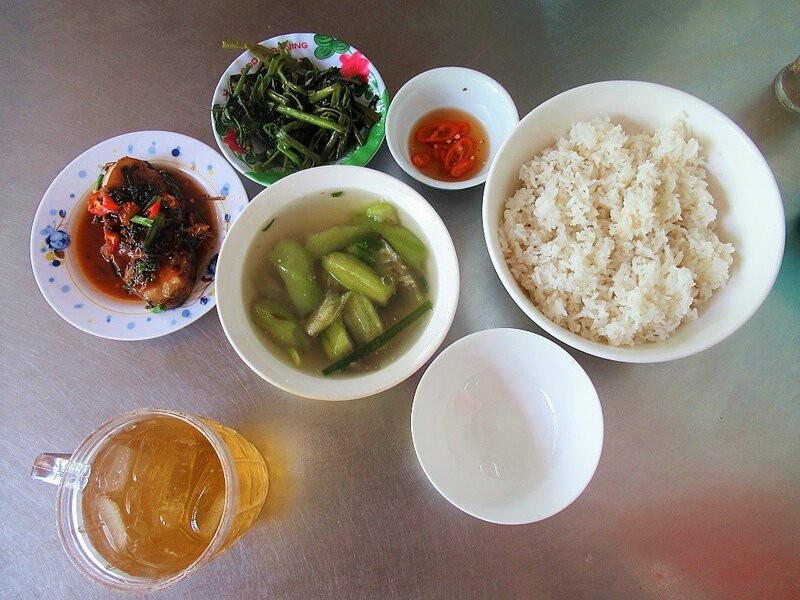 All the classic southern dishes are on the menu, like canh chua cá (sweet and sour fish soup) and rau muống xào tỏi (stir-fried morning glory with garlic) and much more. Although the quality is fine, it’s not great. Lang Dam Trau [MAP]; 50,000-150,000vnd ($2-$7) Among a cluster of beachside eateries, Lang Dam Trau is a shack-style restaurant on the sands of the beautiful curving Dam Trau Bay. There’s lots of seafood on the menu and prices are pretty decent. This is the perfect place for lunch after a swim. There’s a growing cafe culture on Con Son Island, some of which also serve cocktails and beer. For more information about many of the places listed below see my dedicated guide to Cafe & Bar Culture on Con Son Island. Poulo Condor Resort [MAP] & Six Senses [MAP] Both of the two luxury resorts on Con Son Island have bars. 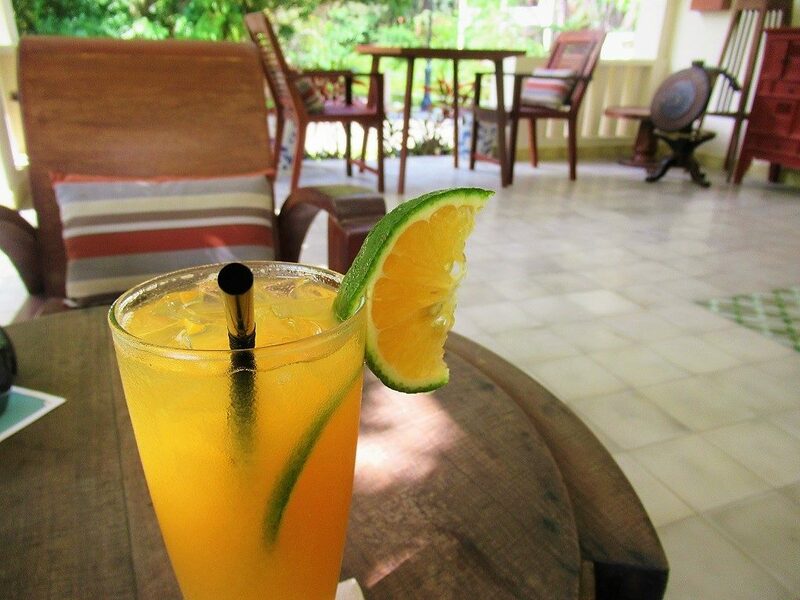 The Six Senses bar used to have a great Happy Hour from 4-6pm. Sadly, the management has brought this to an end, and, with cocktails at $15 a glass, it’s difficult to find a reason to visit this exclusive resort if you’re not a guest. (In fact, last I heard, non-guests weren’t even allowed in the bar anymore.) Poulo Condor Resort has a bar by its attractive infinity pool, which is surrounded by lush mountains, but doesn’t have a sea view. Drinks are good (and fairly pricey), making this a decent option for a late afternoon gin and tonic on the way back from Dam Trau Beach. However, non-guests need to inquire at reception before going to the bar: if the resort is particularly busy, you may not be allowed to enter. Tan Son Nhat Resort & Con Dao Resort [MAP] These two mid-range resorts on An Hai Beach both have oceanfront bars that are open to non-guests. 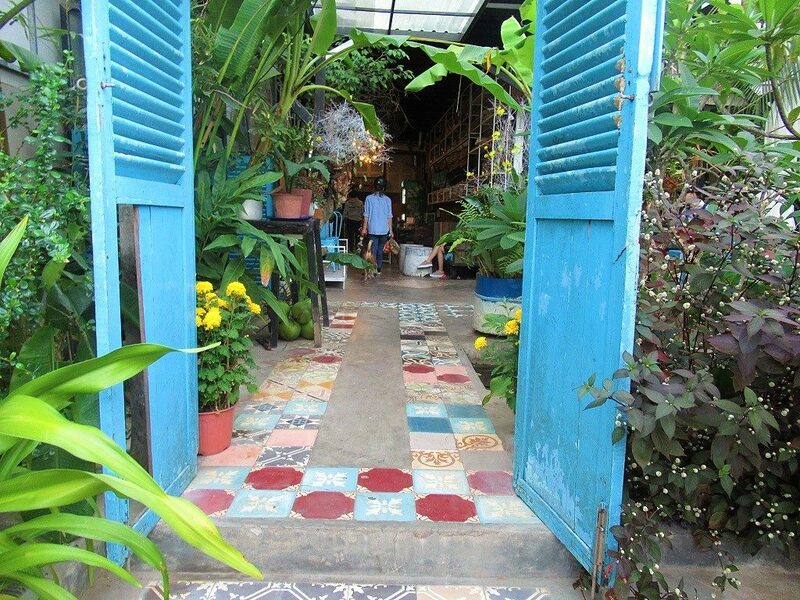 Tan Son Nhat has swings and chairs dotted on a patio under giant tropical almond trees with a selection of cocktails. Con Dao Resort sports a gazebo by the sand in the shade of coconut palms with a short cocktail list. Not long ago, the Con Dao Islands could only be reached by military helicopter. These days, there are multiple daily flights from Saigon (Ho Chi Minh City), and weekly flights from Can Tho in the Mekong Delta. There’s also a new, fast, daily ferry connection from Soc Trang in the Mekong Delta, and a slow ferry service from Vung Tau. Cruise ships even make stops at Con Son occasionally. On Con Son Island itself, getting around couldn’t be easier, thanks to good roads, short distances, light traffic, taxis, and scooter rental. 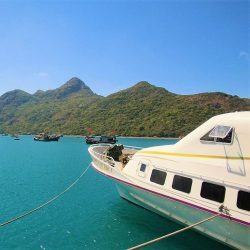 *Please support Vietnam Coracle: you can search all transportation options to Con Dao and make bookings directly from this page by using the Baolau.com search boxes & links throughout this guide. If you make a booking, I receive a small commission. All my earnings go straight back into this website. Thank you. Incredibly, there now up to 10 flights a day in each direction between the domestic terminal of Saigon’s Tan Son Nhat airport and Con Son Island’s Co Ong airport. 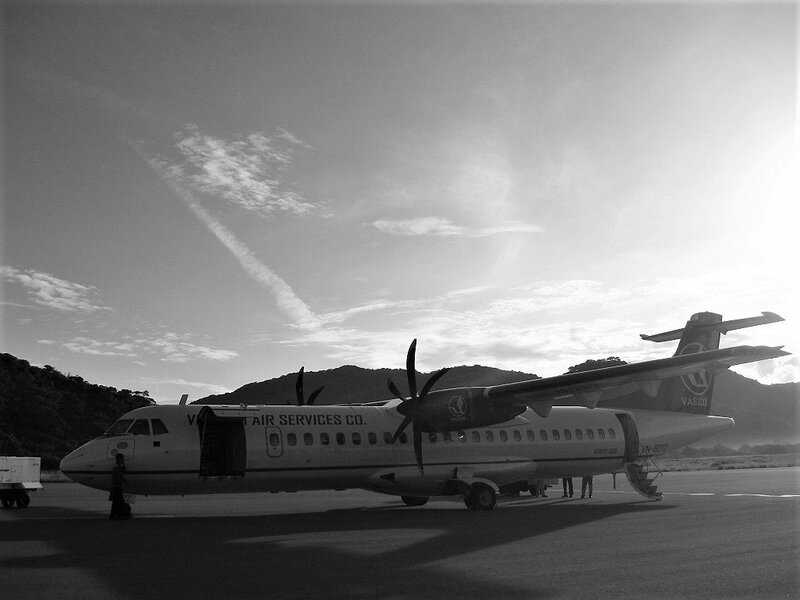 The operator is VASCO, a branch of Vietnam Airlines, which uses propeller ATR 72 aircraft. Flights leave throughout the day. For those with limited time, the early morning departures from Saigon and the evening departures from Con Son are particularly good, because they allow you to have a full day on the island on both days of travel. 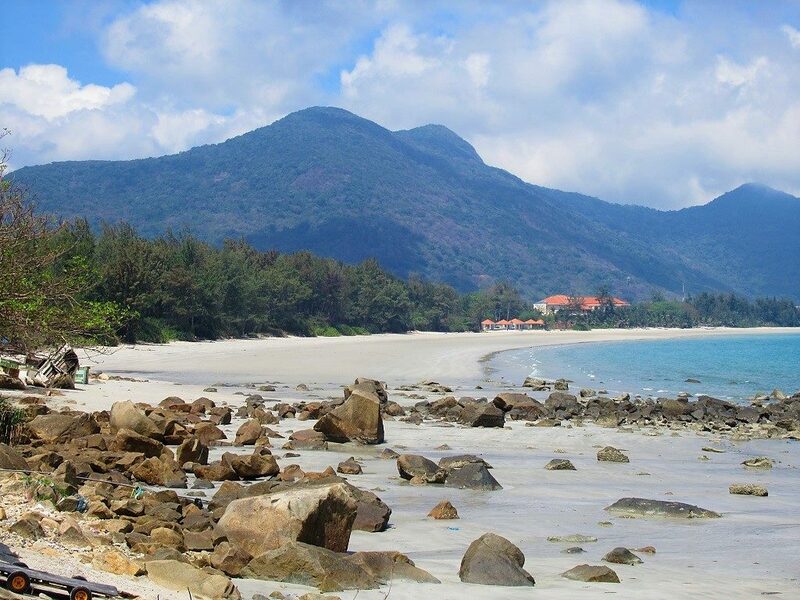 However, flights to Con Dao are notoriously expensive and, in some cases, difficult to purchase. The latter is true mostly on weekends and during public holidays, when flights are often completely sold out. Return fares are between $100-$150, which, considering it’s only a 45-minute flight, is a bit steep. Book early to avoid disappointment. Another option, which is convenient if you’re travelling in the Mekong Delta, is the twice daily connection between Can Tho and Con Dao ($120 return). Alternatively, you could buy two one-way tickets: Can Tho to Con Dao and Con Dao to Saigon, for example, thus creating a kind of Mekong Delta-Con Dao-Saigon loop. All flights (and flight combinations) can be easily searched and booked on the Vietnam Airlines website : www.vietnamairlines.com. Soc Trang→Con Dao ferry: A new ferry runs between Tran De port, in Soc Trang Province in the Mekong Delta, to Ben Dam port on Con Son Island. The ferry sails at least once daily in both directions (an additional sailing is added on weekends and public holidays). The voyage only takes 2-3 hours depending on sea conditions, and the vessels are modern, fast, and comfortable. Ticket prices are around $15 per person. You can also take your motorbike or bicycle on board. For full details, including ticket prices and schedule, please see my Guide to the Con Dao→Soc Trang Ferry. Vung Tau→Con Dao ferry: A boat leaves several times a week (one sailing every other day in each direction) from Cat Lo port in the seaside town of Vung Tau, which itself can be easily reached by ferry from Saigon. Departure time (the same in both directions) is 5pm and the voyage takes roughly 12 hours, arriving at dawn. 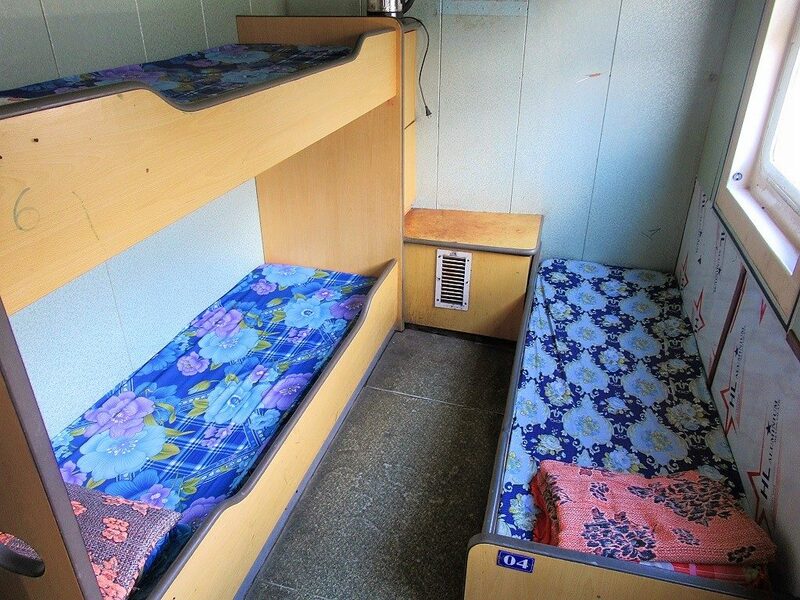 There are some sleeping berths on board and even the coach-style seating cabins are air-conditioned. However, conditions are rather cramped and there’s the distinct odour of previous passengers whose stomachs didn’t take too kindly to the rough seas. There’s only a small selection of drinks and snacks available on board, so it’s a good idea to bring your own. It’s certainly an ‘experience’ if you have the time, but most travellers would be better off flying or taking the Soc Trang ferry (see below) instead. However, by far the most romantic introduction possible to the Con Dao Islands is arriving by boat at dawn in the beautiful surrounds of Ben Dam harbour. Ticket prices are around $10-$15 (one-way) and it’s also possible to take your motorbike or bicycle on board (for an extra fee). Note that boat times and sailings are subject to change or cancellation according to weather conditions. Tickets can be purchased at the either of the ports. Some additional information and contacts for booking tickets can be found here: www.OSCVietnamTravel.com. Walking: Con Son town and seafront promenade are wonderful for strolling around. Everywhere in town can be reached on foot. The town’s beach (An Hai beach) is also within walking distance. There are a number of treks on Con Son Island, some of which can be started from Con Son town, but others you’ll need transport to get to the trailheads: click here for more details about treks. 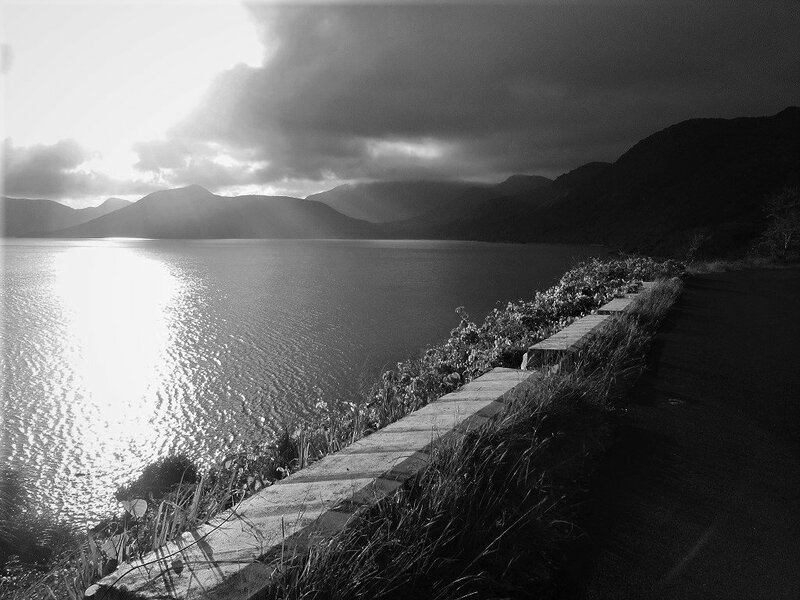 Bicycle & Motorbike: Cycling is nice as the roads are all but empty and the scenery gorgeous. Bicycles can be hired from some accommodations on the island. However, in my opinion, there’s no point in coming to Con Son Island unless you hire a motorbike (well, a scooter, really). 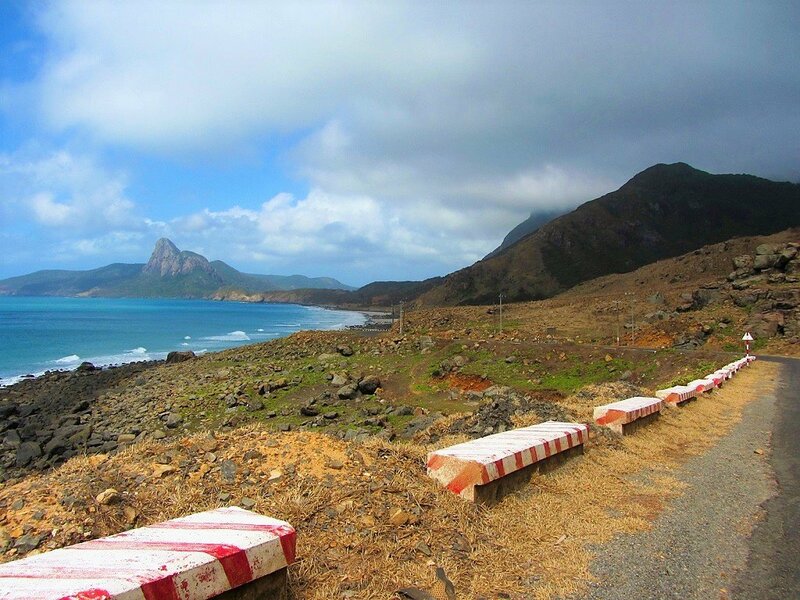 This gives you the freedom to really explore the island: find deserted beaches, go down dirt tracks, and admire the views from the coast roads. 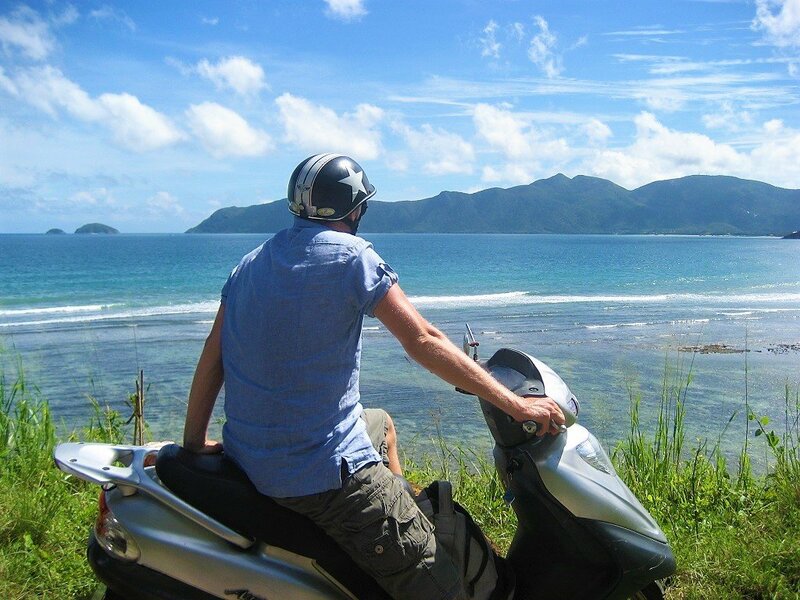 Vietnam in general is best seen on a motorbike, and Con Son Island is the perfect place to learn to drive if you don’t already know how. The well-maintained but empty roads give you all the space and time you need to get familiar with driving, although you must still be extremely cautious. Note that there are only three gas stations on the island: two in Con Son town, the other near Ben Dam port (which is rarely open). These gas stations often close for lunch, so remember to fill up as soon as you get your scooter, and keep an eye on the fuel gauge so as not to run dry on the other side of the island. All three gas stations are marked on my map. Scooters can be hired from most resorts and guesthouses. Prices are around 100,000-150,000vnd ($5-$7) manual/automatic per day. For more about riding a motorbike on Con Son Island click here. Taxi: There are at least a couple of taxi companies on the island now. 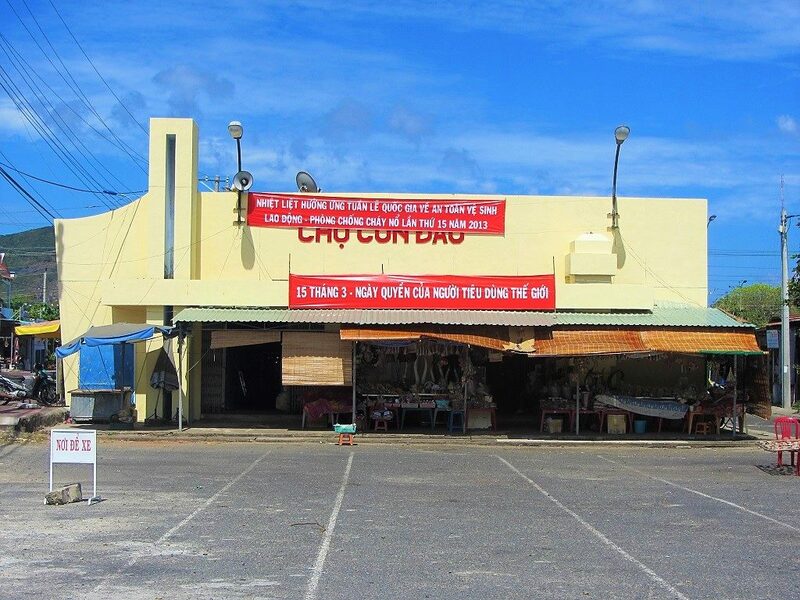 Con Son Taxi (02543 908 908) has a modest fleet of cars that are always available to take you into town, or to the beaches around the island, or to/from the airport and ferry port, or to drop off and collect you at the beginning and end of trailheads. 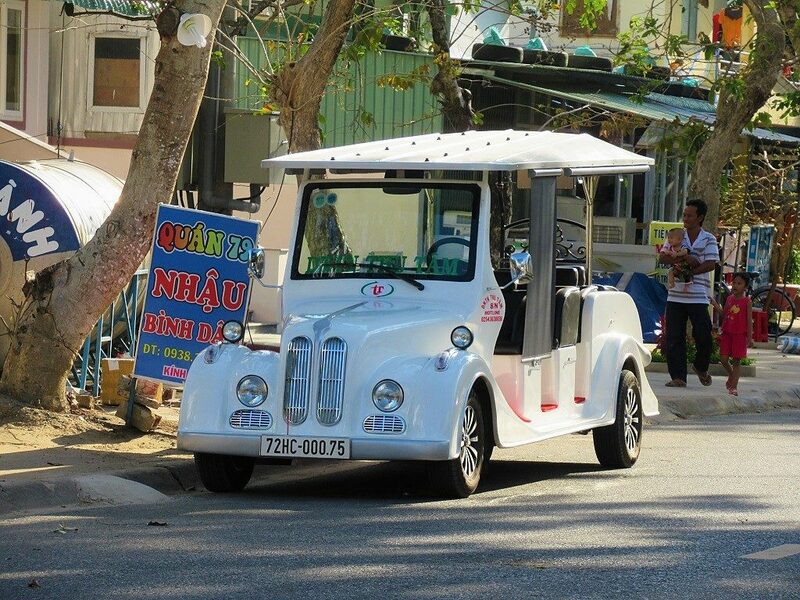 Interestingly, there’s a new kind of taxi service in Con Son town that uses electric cars (you can’t miss them: they’re designed to look like classic cars from the turn of the last century) to ferry passengers on short hops from A to B. Call their hotline: 097 422 7085. 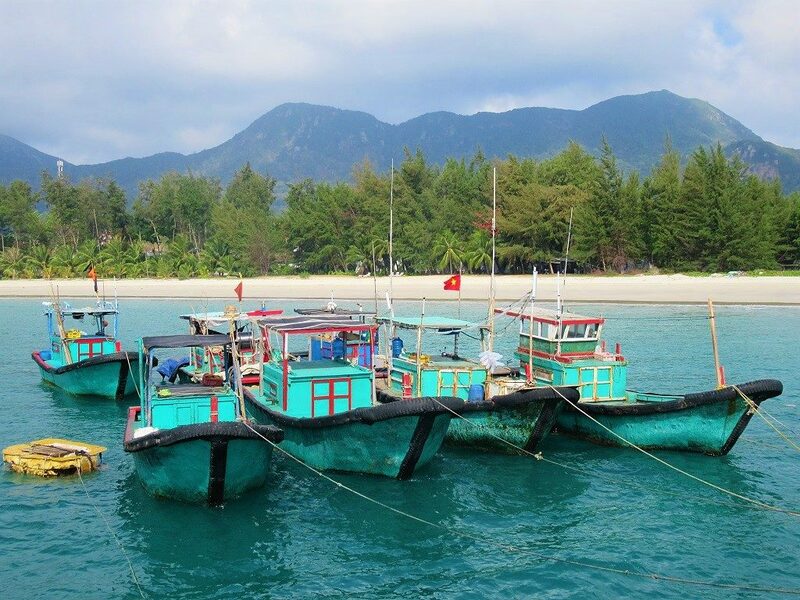 Boats: Exploring the outlying islands by boat can be organized through the National Park Headquarters or Con Dao Dive Center. Try to get a group together as this will spread the cost, which is usually between $50-$100 depending on where you’re going. Note that during rough seas boat trips can be cancelled. This is most likely from November to February. 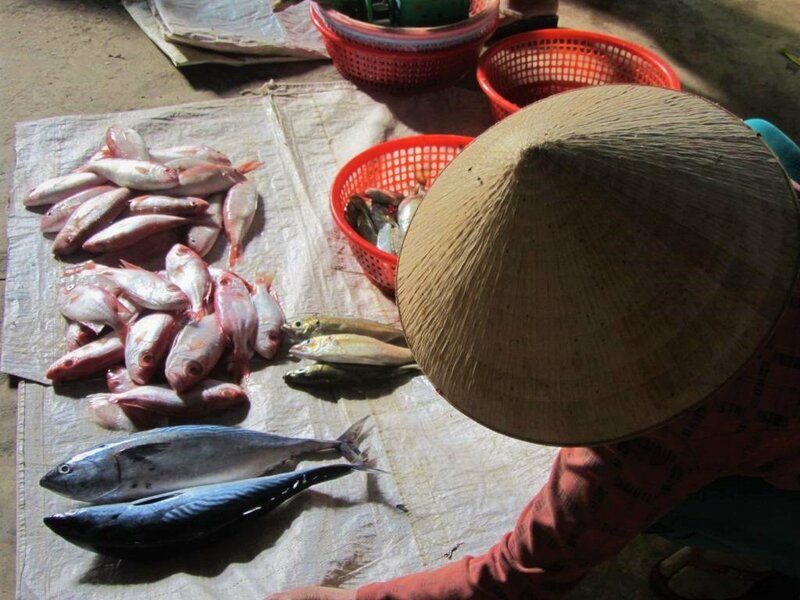 For more about boat trips in the Con Dao Islands click here. My favourite time to be on the islands is from March to June: the weather is hot and generally dry, and the sea is blue and smooth as glass. Either side of New Year (November to February) is the driest time, but it can be pretty windy: the sea is choppy, lying on the beach is difficult to enjoy with the sand blowing in your face, diving conditions aren’t great, and, if you’re planning to arrive by sea, boats are often forced to cancel. Summer months are hot with calm, clear waters, but there’s always the chance of some heavy monsoon rain. October tends to be the worst month, because the islands are subject to the typhoon winds which blow in from the northeast. This entry was posted in ALL, Beaches, Con Dao, DESTINATIONS, Islands, Near Saigon, The South and tagged beaches, Brad Pitt, Con Dao, Con Son, guide, islands, prisons, six senses, travel, Vietnam. Bookmark the permalink. It holds just over 600 passengers and is a double story catareman taking just over 3 hours for the trip. Passengers over 60 have a further discount. A lot of the hotels you mentioned were booked out…at short notice…and I hope the influx volume this ferry capacity does not spoil your beloved Con Dao. We have a small group booked next week, so can let you know how the boat ride is, could be still a little windy based on the time of year as you say, and it has been a little windy in Vung Tau the last few days. Really like your detailed motorbike ride guides. We put the bikes on the train Hanoi to Saigon for 1 million vnd (and fly back) there was no charge at the other end by handlers, but it took quite a few days for the bikes to arrive just prior Tet. Yes, I had read about the new fast ferry – it’s very exciting and I look forward to trying it. There’s also a fast ferry due to start operating between Saigon and Con Dao (5 hours, beginning in March). As you say, I hope this won’t inundate the islands. Please do let me know how your voyage goes. Thanks for providing such great information ! Do you know who is the operator of the new Vung Tau ferry and the future one from Saigon and if it is possible to buy tickets online ? 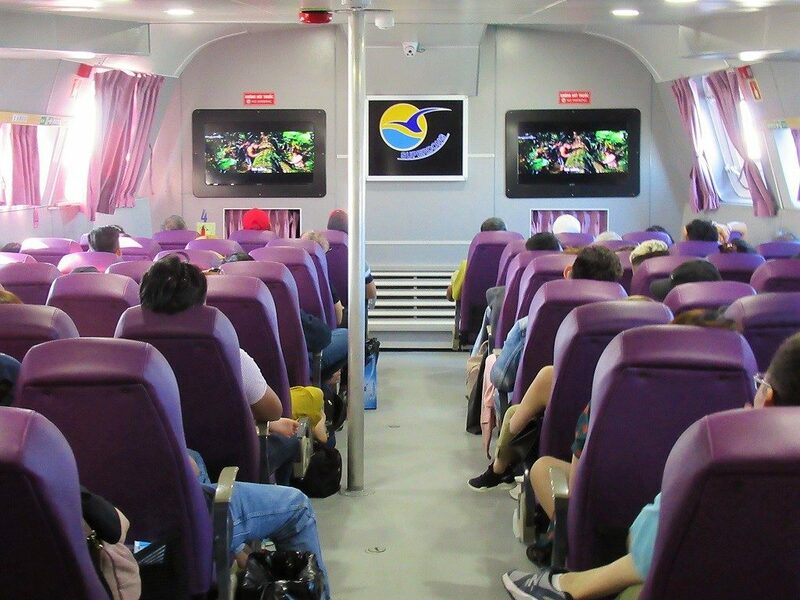 It’s operated by Phu Quoc Express and you should be able to book tickets online – google them and check their website. The Saigon-Con Dao ferry is due to start in March, but one of their boats on a different route has had technical problems, so I suppose there could be a delay in the launch of the new route. I hope to review both of these new ferry routes within the coming months. Great thanks , will be there in April ! September might be OK. It’s probably just before the really windy season. So the weather might be fine. However, there is the possibility of a typhoon coming in from the east – but you can’t plan for that. I’ve been twice in late August and the weather was great. When I asked that question at Poulo Condor they said it was possible as long as the resort was not busy. However, the price was quite high. I didn’t ask at Con Dao Resort or Saigon Con Dao Resort, but I would guess it’s possible to pay to use their pools and that it’s a lot cheaper than Poulo Condor. I’m quite sure you can’t pay to use the pool at Six Senses. 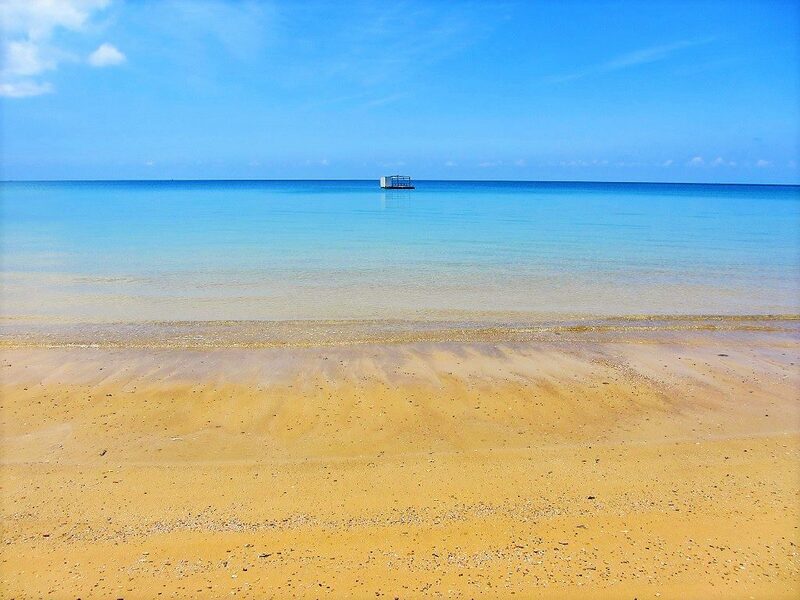 It’s worth remembering that the sea is often calmest in the mornings – on both sides of the island. Thanks for the reply we will ask to thel hôtels. Today the weather is better and we can swim at Damien Trau it’s cool ! We sleep in a New hotel : Hotel De Condor it’s really nice, the family is so cute and for 32€/day for 2 persons with the Breakfast I think that it’s really a good option ! Sorry Dam Trau beach of course ! Also if some of yours readers are vegetarians there is a really good option in town : Chay Con Dao Healthy : good, prices are really ok (around 40 000 VND for the vege pho and others meals) and the woman is really Lively. Glad you managed to swim. Thanks for the suggestions – another traveller also just recommended Hotel De Condor to me. And the vegetarian restaurant sounds great – I’ll definitely try it next time I’m on the island. Thanks so much for this helpful guide! The afternoon ferry does not seem to be available to book on the website. Do you have to book this by turning up on the day? Yes, I think the regular afternoon ferry is only fairly recent – it used to only run when there was high demand. So I would guess that if it’s not available to book online, you need to try in person or over the phone. We are planning to be in Con Dao early March. We’ll try booking the afternoon ferry over the phone and will report back here to let you know how it goes! Thanks again for this fantastic guide. 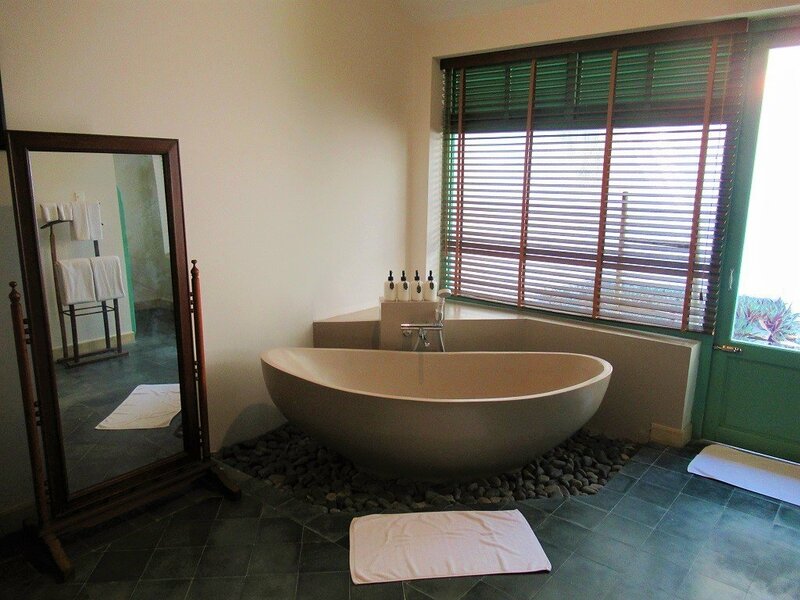 February 2019 20% discounted price is 528,000 dong each way and a 88,000 discount for over 60 years old each way. Booking office is at the terminal near Ganh Hao 2 restaurant. We have a small group going next week! I just arrived in Con Dao, I was surprised to see several Mai Linh taxi waiting at the harbour. I tried the Mai Linh app on my phone and it worked, the app can be used to book a taxi. I also tried Grab and Con Dao is not covered bu thir service. Oh really. I can’t remember Mai Linh being there before; just local taxi firms. A sign of the island’s growing popularity, I guess. As someone who has covered so much in the way of travel and logistics I am surprised that when I searched “insurance” only this post was listed in the results and it didn’t have anything to do with actual personal insurance. As a foreigner in based in Vietnam what company or companies do you use for insurance be it general health insurance and/or temporary/permanent travel insurance in or or outside of Vietnam? Yes, it’s strange that this post came up for travel insurance; I don’t know why that would be. There are lots of worldwide travel insurance companies out there: many of my friends use World Nomads – you can try checking them out. Many thanks for writing such a detailed guide for Con Son, for which information are hard to find. I would like to ask you if there is a possibility to see somewhere in Con Son bioluminesce plankton, like in Koh Rong. Not that I know of, but it’s worth contacting the the dive centres on Con Son to ask them if they have any information about it. 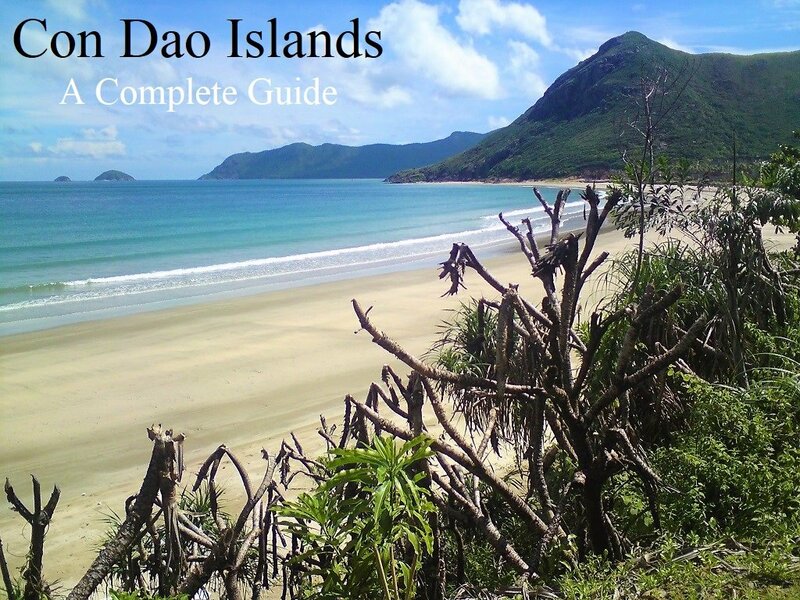 Thanks Tom for offering this detailed and helpful guide to Con Dao. We followed your recommendations over our 3.5 day trip. I highly recommend the prisons, followed by coffee at Con Son Cafe, overlooking the pier. And visiting the cemetery at night if you can swing it. One additional data point: we stayed at Thien Thanh Star hotel and had a booking mishap (please confirm with them even if you booked online through an aggregator) so got stuck in a fairly dirty, mosquito filled room. The receptionists could not speak English. 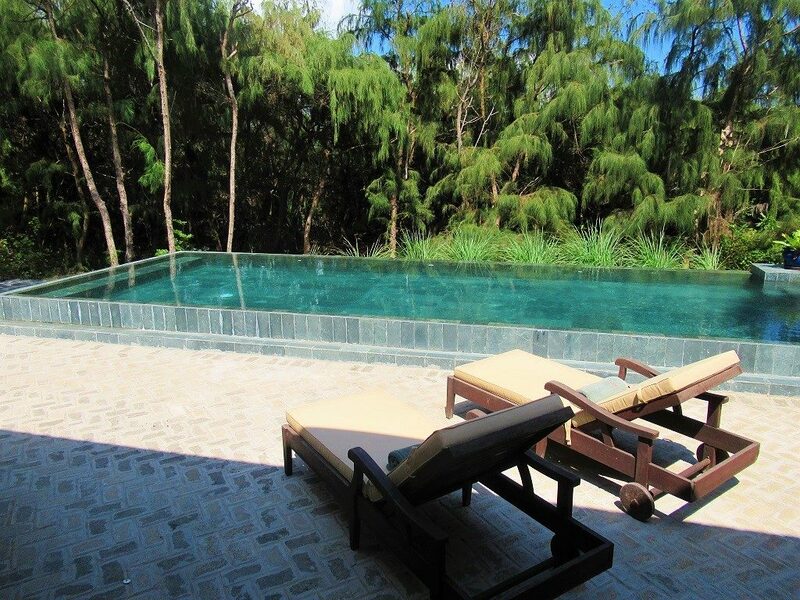 We also heard that VinGroup recently snapped up Dam Trau beach and the surrounding area, so go visit while you can! I can see why you love the island – I think it’s not just a great place to unwind but also a must-visit historical site for those of us who live in Vietnam. 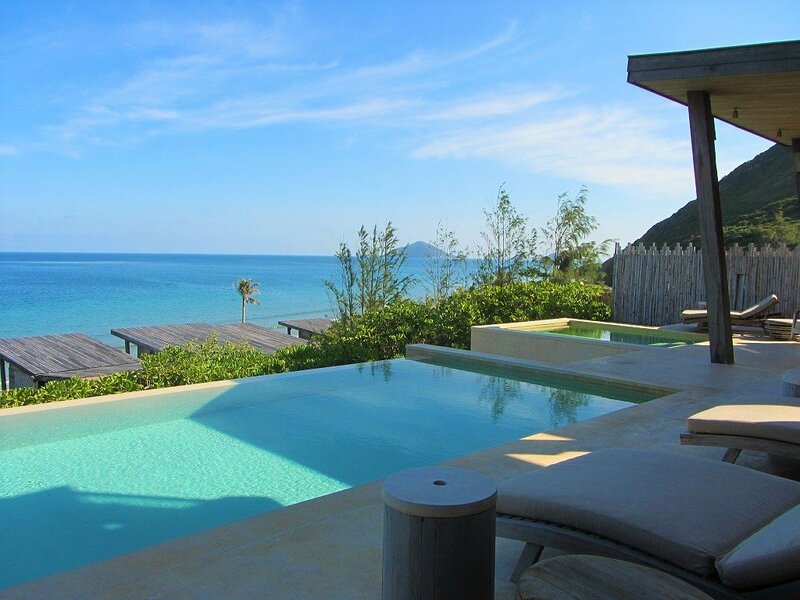 Good to hear you enjoyed Con Dao. Sorry about the mishap at the hotel. Thanks for the updates – that’s really depressing to hear about VinGroup. Oh, well, I guess it was inevitable. Thank you very much for this guide, it definitely seems to be the best I have found yet. I will be travelling solo to Con Dao from Can Tho this coming Wednesday. I was wondering if there is any chance of getting dorm accommodation there (I will be there until the Easter weekend so maybe will get busy with locals?). Also I understand that Dive Dive Dive is now closed. I got in touch with Larry who did not feel comfortable recommending an alternative point of contact and/or dive centre. Do you have any tips?I have only dived very few times so looking to do a “try dive” and some snorkelling (the latter probably even by myself). 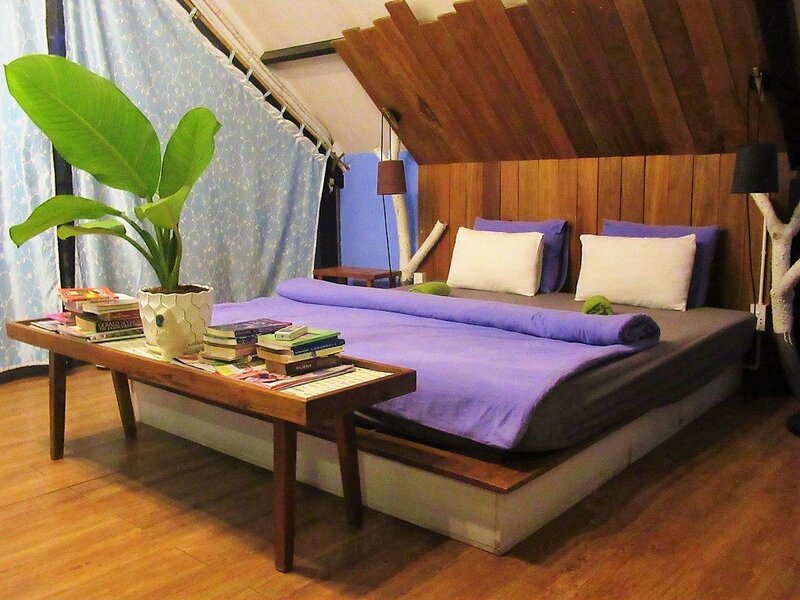 You can try Uyen’s House for dorm beds – they’re about 200,000vnd each – book in advance because it’s popular. Or Hai Nga and Sala are also very cheap places to stay. In general, there are now lots of good mini-hotels in Con Son town, but the prices are still higher than the mainland: about $20 a night. Q Song Chi, Red Hotel, and Hong Ngoc are all good for that price. I’m currently updating this guide, and will be focusing on the Accommodation section over the next few days. 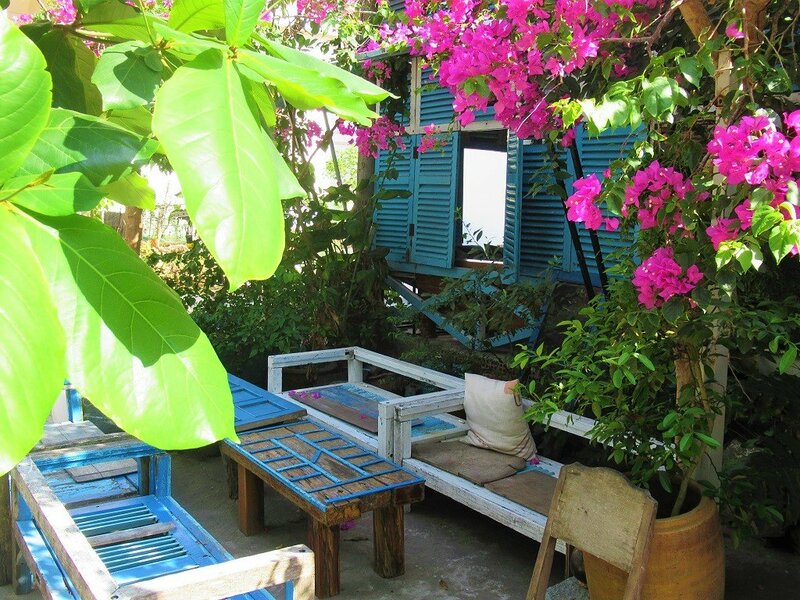 For diving, (yes, it is a shame about Larry leaving) you can try Con Dao Dive Centre at Bar 200. I think it’s Gordon who runs it: I didn’t go on a trip with him, but I met other travellers who did and they were happy with the experience. Many thanks, this is helpful. I have just checked and nearly all of the budget accommodation (up to $30 p/n) seems to be fully booked (same with the flights back to HCMC)! I think I am just going to have to take what I get unless it would be OK to have a browse at guesthousea once I get there? I will book the ferry from Soc Trang from your link shortly and will be in touch with the diving centre at Bar200 once I get there (if I do!). Thank you so much for your help, especially since I was obviously wrong thinking I could just be spontaneuos and last minute about this. Yes, you may have trouble getting flights over the weekend – they are often fully booked from Friday through Monday. It’s worth checking the Windy website was the projected winds for your stay on Con Dao – because if winds are high diving won’t be possible and ferries won’t sail. I was recently on the islands for 2 weeks and although occupancy was quite high I was able to find places to stay every night. 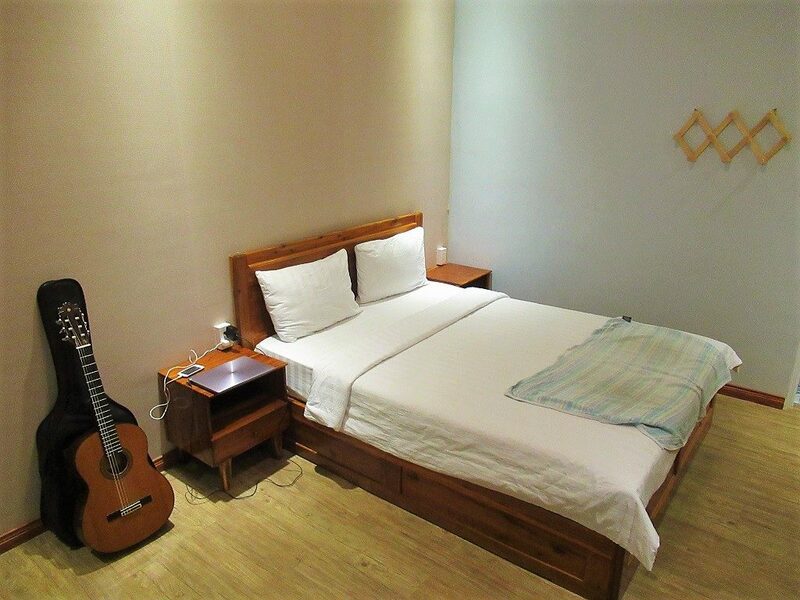 Great stuff, I managed to book a couple of nights at Q Songchi from your link. Also booked the ferry from Tran De and checked that Windy website, very useful. First off – great website! I’m so happy to have finally found more information on this part of Vietnam as so few people write such detailed pieces. I am looking into the trip from Tran De port to Con Dao islands on the SuperDong boat. I would be travelling at the start of May. I was trying to get more information as to whether I can book the boat in advance? I don’t want to arrive and find out the boat is sold out or we can’t get tickets as we will be on a tight timeline. Any advice is greatly appreciated! I’ve just published a full guide to taking the ferry from Tran De to Con Dao here. I will be traveling to Vietnam with my husband to-be for our honeymoon at the end of June. Despite knowing that it is not the ideal time to visit the islands in the south, we both feel like visiting a picturesque island at the beginning of our trip to relax and de-stress after the wedding. Is it a good idea to visit Con Dao at the end of June? We were told to not go to Phu Quoc then and were advised to visit Con Dao instead. However, we are still worried that the heavy rain would ruin it for us. Does it rain all day long? Or is it just a spurt of heavy rain in the late afternoon as it is in other areas? Any Advice? No, it doesn’t rain all the time – unless you get unlucky and your visit happens to coincide with one of the dozen or so annual typhoons. In general, the mornings start nice, sunny and clear, and the clouds bubble up over the course of the afternoon, eventually bursting in a heavy tropical downpour which lasts an hour or two but then clears up. However, you can’t guarantee what the weather conditions will be, especially on Con Dao, which is stuck in the middle of the ocean and therefore exposed to all sorts of winds and weather patterns. 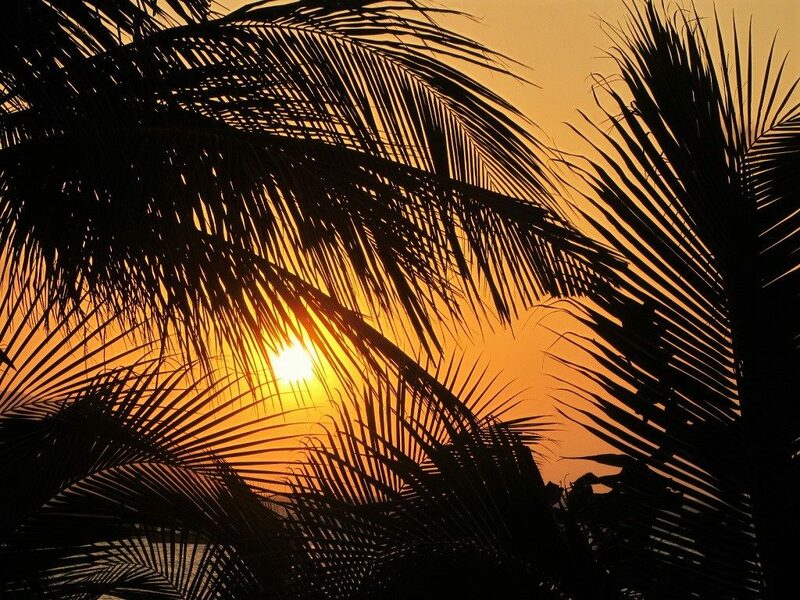 I would imagine Phu Quoc is just about OK in early June – I’ve been in May before and it was absolutely fine. 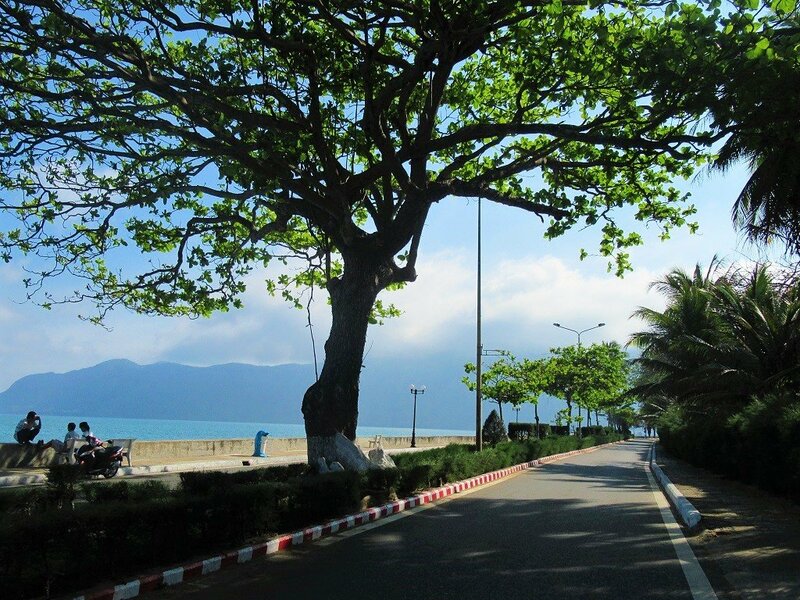 Other relaxing beach areas to consider at that time of year are Quy Nhon, Hoi An, and Nha Trang – you’ll find plenty of places there to while away a few days on the beach, especially if you’re willing to pay a bit more for your honeymoon accommodation. Hey Tom, I’m looking for accommodation for a month starting late April. Any recommendations in where to start? Forgot to mention that I’m looking for accommodation in con son…. If you’re going to stay for a month I’d suggest taking a look at any Airbnb options that there are in Con Son. Have a quick look on their website to find out what’s available – I’m sure you’ll find something there. The ATMs should be fine on the island, but it’s best to bring cash as well, just in case. this is Arianna from Italy. First of all I want to thank you for your amazing WebSite, it’s far more usefull than any other guide, and I can clearly see you really love Vietnam. This will be my fisrt time there and I’m gonna stay in the South for a couple of weeks during Christmas time. I’m a bit worried about sand flies in Con Dao but you didn’t say anything about it in your articles. Then, I also saw that Dive! Dive! Dive! will be closed this yeas, and they had their own repellent…. any advice about it? have you evere had problems? Thanks in advance for everything, I’ll book as many rooms as I can from your links during my trip just to give you a little help to go on with your extraordinary VietnamCoracle. Bye! Yes, unfortunately sandflies can be a problem on the Con Dao islands (I thought I’d mentioned it in the guide, but perhaps I forgot). Strong insect repellent seems to work OK, and suncream too. I think on some beaches they’ve also started to spray the areas. The flies seem to be more ‘active’ during the mornings and late afternoons. I’m not sure if there is any real solution to sandflies, but they are isolated to the sandy beaches, particularly the main beach near Con Son town. Thank you for trying to book your accommodation through my site – it’s a great help to me and the website. 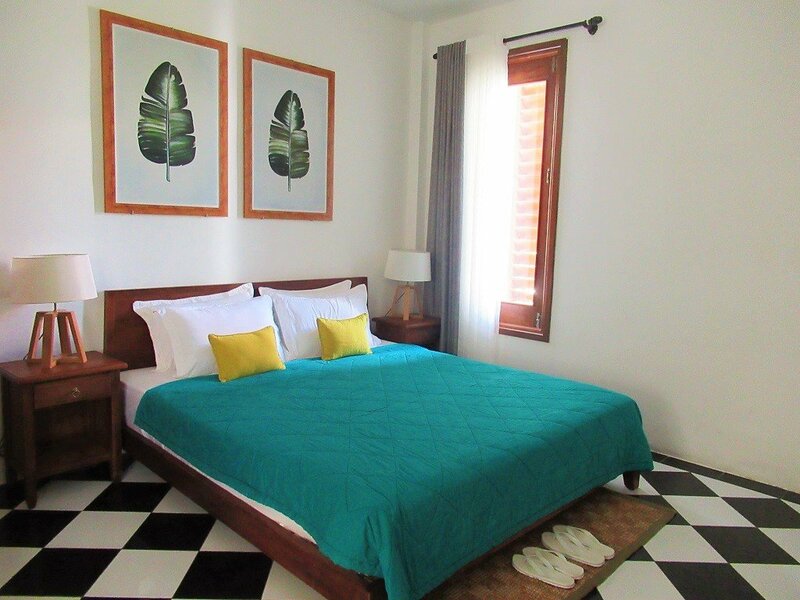 I’d love to add to your info my experience with a new hotel and restaurant on the Island, Villa Maison. We didn’t stay there (sadly), but went for a meal based on the recommendation of some of the divers. It was so lovely we went back 3 times during our week in Con Dao! Beautifully cooked and presented meals, on the higher end of the scale as far as offerings on the Island go, but in my opinion, very reasonable prices for the quality presented. The owner was a real gem too. It is a fantastic addition to the Island, offering fine dining right in the middle of town. Great to hear that you enjoyed the islands. Thank you for the recommendation – it does sound excellent. I’m planning a trip back to the Con Dao within the next couple of weeks (time permitting), so I will certainly check it out when I’m there. Thank you very much for this very helpful guide and useful tips! 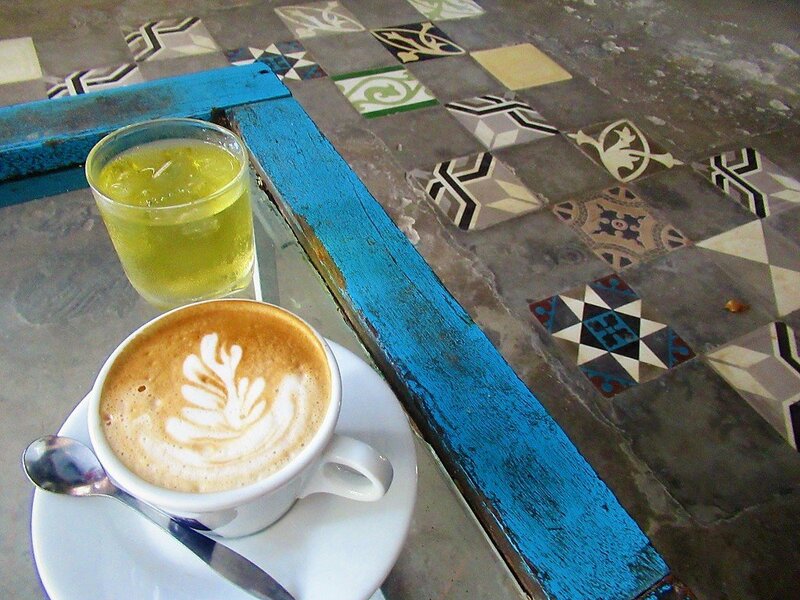 I juste have a few questions: I am working in HCMC and would like to go to Con Dao. But every time we want to go, it is impossible to get plane tickets from the airlines website, they tell us it is all booked (both Vietnam Airlines and VASCO). For example, we want to go there mid-June, and it is impossible to get tickets (and it is not the first time). Did you face the same issue? Do you know how much in advance we should book? Can we get the tickets directly from the airlines or do we have to book through a tour operator (and if yes, which one?) Sorry, it is a lot of questions… But I am looking forward to hearing back from you 🙂 Thank you very much in advance for your assistance! Plane tickets are subject to scam between Vietnam Airlines staff and local travel agents, the internet will often tell you flights are booked solid for months in advance. This is rarely the case and the planes are only full near national holidays. If you are in Vietnam, contact a local travel agent. If that does not work, I now refer you directly to a local travel agent, Ms.Van. She will need a copy of the picture page of your passport to insure your names are spelled correctly. She will need a list of flights, by date, number and time that are acceptable to you. Both arrival and departure. Her ability to answer specific questions about airline policy is limited, as she is not an official agent, but has access directly to booking central office at VN airlines. If you have questions beyond basics you will need to refer back to the Vn airlines website for things she cannot help with. Wow, this is an amazing detailed guide to Con Dao. I was there last February (staying with a friend is a local teacher) and this place instantly became my favorite destination in Vietnam. I don’t know how long you stayed on the island to write this guide but I’m really impressed. Great job! Thanks, it’s good to hear that you enjoyed your stay on the islands. Dear Tom, we found your website when traveling by motorbike and felt very thankful about your wonderful iterinaries (although inline GMaps sometimes crashed our mobile browsers). Now again, as we’re staying in Con Son, we get inspired by your articles. Thank sou so much!! For your information: seems old Con Dao Museum is closed for restoration these day. Thanks. 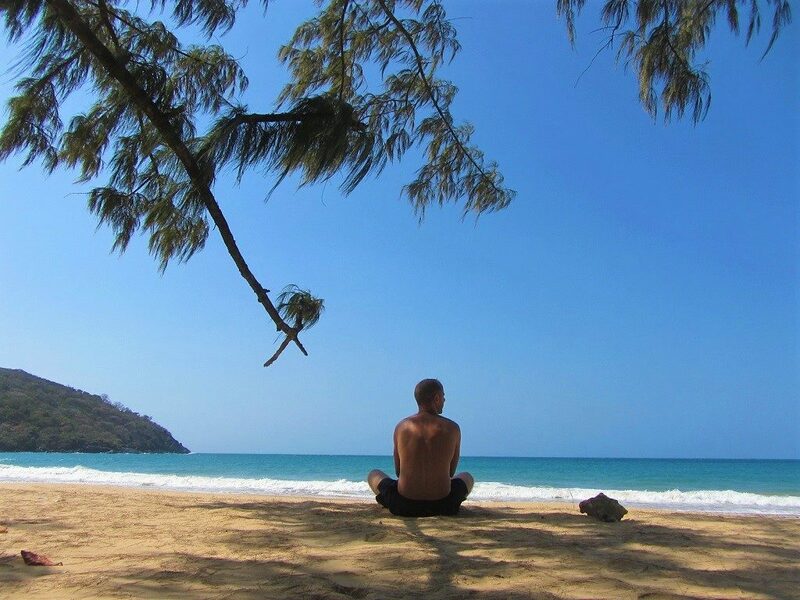 It’s great to hear that you found my guides useful and that you are enjoying Con Dao now too. Thanks for the update about the museum – I hope to visit again soon too. Thanks so much for this post, probably the most useful resource for the islands I have found. We had a great few days on Con Son last month and possibly would have never heard of the islands if it wasn’t for you, certainly no other traveller we mentioned them to had any idea about them, and while we were there, there was only a handful of non Vietnamese tourists aside from us. After visiting Phu Quoc for the second time a few years back and being disappointed with how it had developed since my first visit, the Con Dao islands were a breath of fresh air. I hope you get the chance to back again. Hi , really enjoyed reading your article, information very helpful and clear. I am thinking of visiting the Island in December/ Christmas this year and am travelling with three children under 7!!. Do you think you can still swim even though the seas can be more choppy at this time of year and when you say it can be windy, are you unable to sunbath in December??? Yes, the weather can be windy and the sea choppy or, at times, rough. But you’ll still have sunshine and warmth too. Sunbathing and swimming is still possible. I’ve visited the islands in December/January many times and always enjoyed it. But, of course, there is always the chance that you’ll get unlucky and arrive during a bad spell that could last a few days. Unfortunately, that’s just a chance you’ll have to take if visiting Con Dao at that time of year. If you want guaranteed good weather and calm waters then Phu Quoc is your best bet during the Christmas holidays. But it’s a different place compared to Con Dao. I don’t have children, but I would imagine they’d love either of the islands. It might be worth contacting Larry from Dive,Dive,Dive (see above) for some more details about weather etc. I am from Bulgaria and I intend to visit Vietnam in May this year with a girl friend of mine. I would like to thank you for all the information you share, it is definitely very helpful . 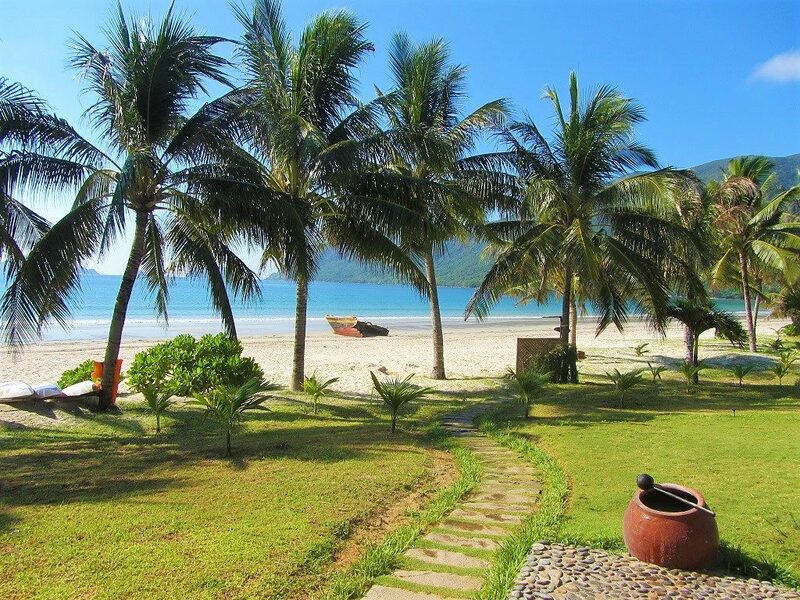 We will arrive from Cambodia and we have not yet made out choice between Con Dao or Phu Quock. 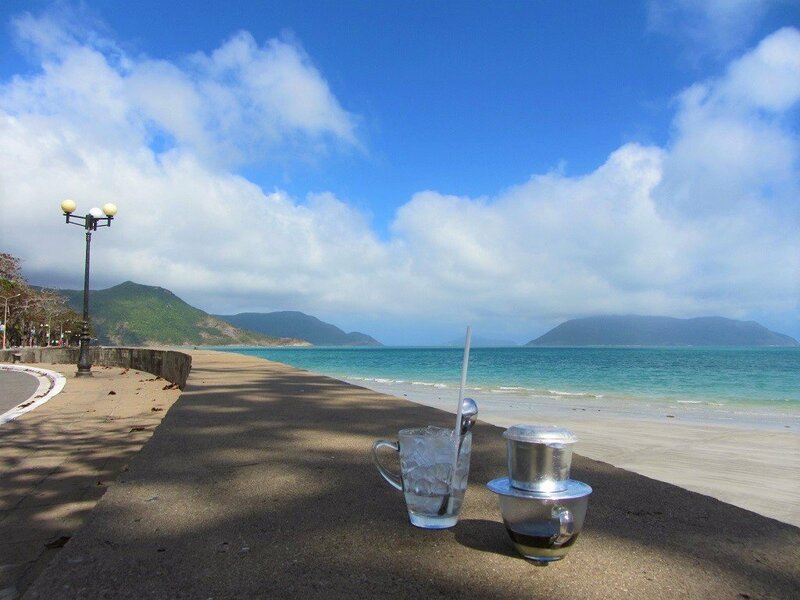 You are describing Con Dao as a beautiful ,wild island and there are not so many left any more in the world, so it attracted our attention very much. We are not able though to find out how we can book a flight from Ho Chi Minh to the island. And do you recommend to book a room in advance ? Yes, Con Dao is still a wild and beautiful island. If you are having difficulty choosing between Con Dao and Phu Quoc have a look a my guide comparing the two islands here. You can book flights to Con Dao or Phu Quoc directly through the Vietnam Airlines website: there is a link to Vietnam Airlines in my Con Dao Islands guide here or in my guide comparing Con Dao and Phu Quoc here. 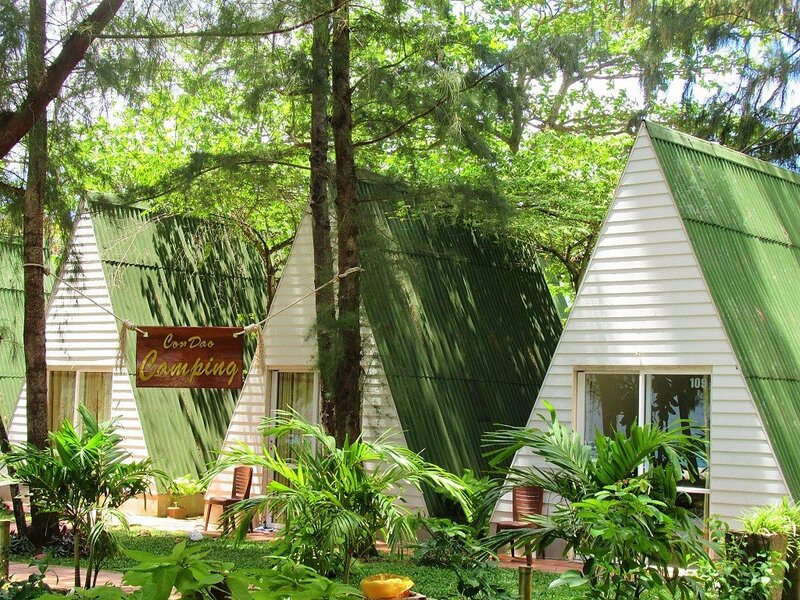 Yes, it’s a good idea to book your accommodation in advance on either Con Dao or Phu Quoc: you can find my recommendations of hotels on Con Dao here, and some places to stay on Phu Quoc are mentioned in my guide to Phu Quoc’s beaches here. 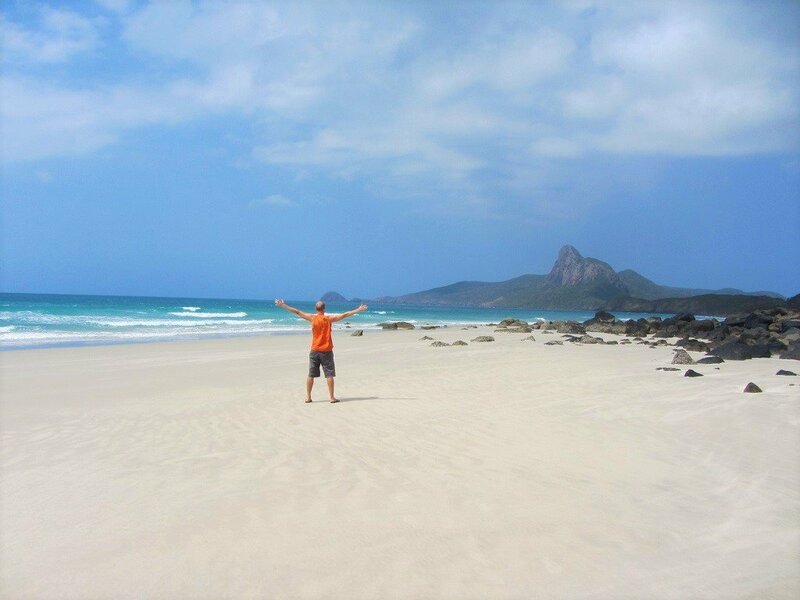 I’ve also written a guide about how to visit the Con Dao Islands on a budget here. Lovely shots – and inclusion of some history. Well done! Thank’s Rex, glad you enjoyed it. Thanks so much for this blog, it’s so helpful 🙂 I have a queston though, I’m trying to find the days and time of departure of the boat to Con Dao, but the website that you give is not updated and the email addresss doesn’t work… Do you have any idea where I can find these? Yes, the website and schedule is famously unreliable. Try contacting Larry from Dive, Dive, Dive! and asking for more information about the boat (although he’s not a fan of taking the boat, I’m sure he’ll help you out getting the right info :-)). Thanks so much, Tom! Hey do you think I could find any souvenir post cards for sale on the island? I can’t find any thus far. Good question! I don’t think I’ve ever seen any postcards on Con Dao Islands. But if anyone knows it’ll be Larry at the Dive, Dive, Dive shop on Nguyen Hue Street. Wow, incredibly helpful. Thanks for all of the tips. Is it easy to find a mini mart to get water and beers in Con Son? 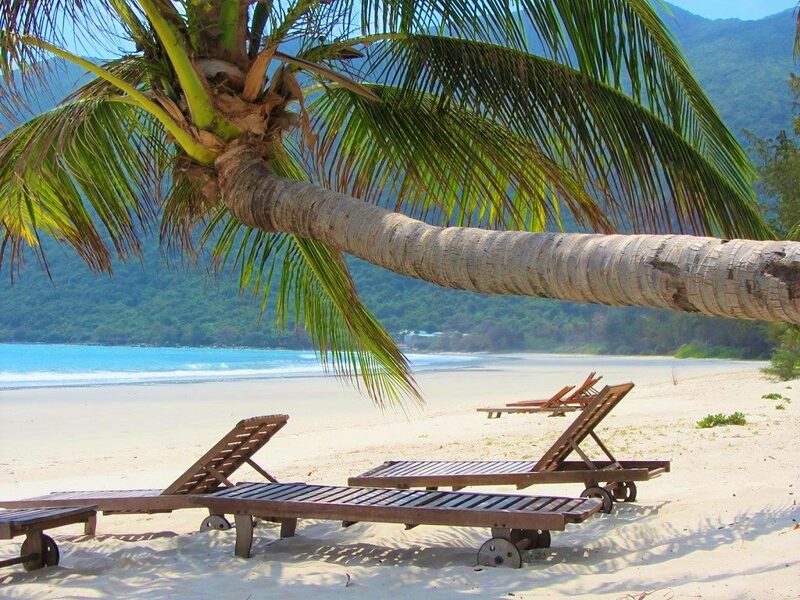 Also it is easy to find chairs and parasols in Con Dao similarly to the ease in Phu Quoc? Yes, there are local shops around the market area. 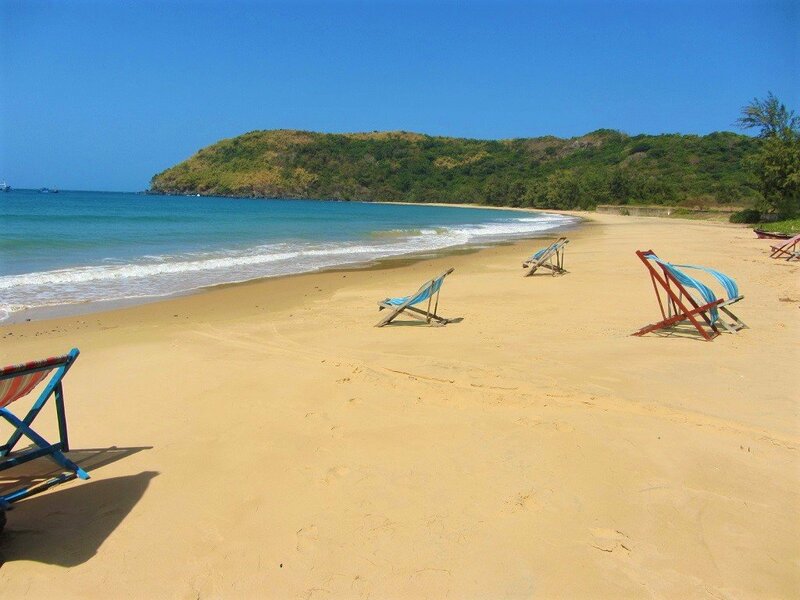 There are chairs and parasols at a few of the resorts like Con Dao Resort, Con Dao Cabanas and Seatravel. Wow, mate. All the work you’ve done (traveling, writing, photos) are amazing. We are in Con Dao now and when we read your blog, we felt like we are living through what you’ve written. All the detailed information and personal accounts are very useful. Thank you for sharing your experiences. Keep up the good work. You are doing a massive favour to independent travelers. More power to you mate! Glad to hear you’ve enjoyed reading. I hope you like Con Dao as much as I do 🙂 Have a great time. I’m so glad I stumbled upon your website and I just have to drop you a word. I really love your article, it’s really good writing and there’s just so much information! I’m currently exploring Vietnam (off and on too, due to work etc), though mostly in HCMC. I think you’re going to be a very resourceful guide for my trips. Awesome job, I just must say that again! Hi Tom, thanks for this great post! I’ll be visiting Con Dao in January/February next year and I’m sure this guide will come in handy. Con Dao has been on my bucket list for quite some time now. Con Dao Island is a wonderful vacation spot, I have read alot about it and plan to visit next year, hopefully of-course. I love swimming and the waters look so tempting, great pictures by the way. Hi, I just wanted to thank you for your amazing work, I live in Saigon and I think Vietnam Coracle is by far the best website about traveling in Vietnam. Great work! First I would like to thank you for noting our business in this, the first well written and up to date and informative article I have seen on Con Dao. I am writing to ask you if I may link to it from my website. Is that okay ? Also to update the information a bit. 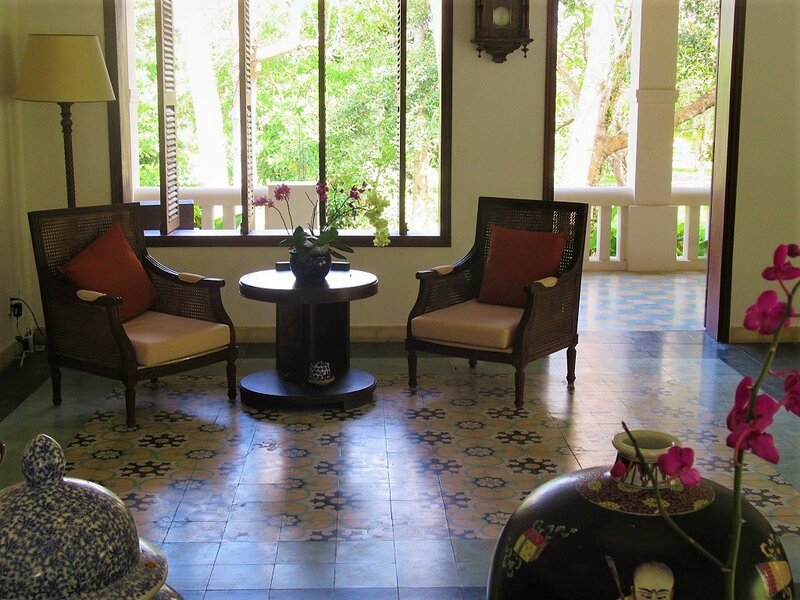 Phi Yen Hotel has closed. 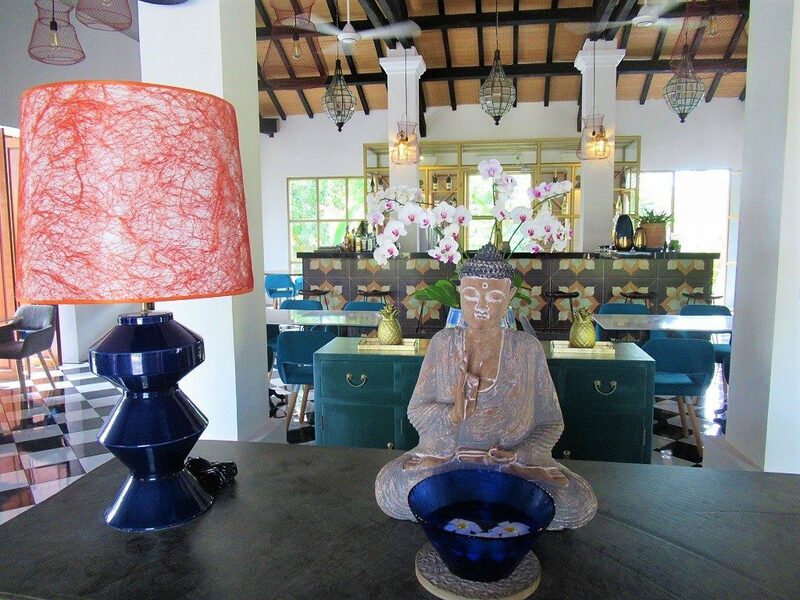 Vung Tau has taken the property back into their possession. If you would like I will be happy to go through all of the article and make any updates as required to keep it current. Please do note the exceptional reviews we have and continue to generate on trip advisor. You can be sure we are a reliable and trusted source of information about Con Dao. Con Dao Seatravel Resort threatened clients for cancelling their booking – We did have to call the police for help! Beautiful! How’s things out East, Tom? Things are good – you should come out here sometime! Hi Tom, Thank you for sharing such a beautiful and informative article. It is a very helpful guide for people like me who always love to discover non-touristy destination. The bike trip is always something very special. I will definitely try this! I am looking forward to reading more new article like this from you soon! I really enjoyed your article – I just moved to the island and would love to have more detailed directions on how to find ‘Quán Ăn Bình Dân.’ I went hunting yesterday but couldn’t spot it. Thanks! I’m glad you enjoyed the article. Unfortunately I don’t have a phone number or exact address for the Quán Ăn Bình Dân, but if you click on the link to Google Maps in my article you’ll find a marker where it is. Or just click here: Either go on Hoàng Phi Yến Street (if you’re coming from the direction of the beach) and then it’s on your left just about 50 metres after going over the Lotus Lake. Or (if you’re coming from the direction of the town) go to the junction of Nguyễn Văn Linh, Huỳnh Thúc Kháng, and Hoàng Phi Yến streets – then continue on Hoàng Phi Yến Street for 100-200 metres and it’s on your right. As I mentioned in the article, it’s not exactly a grand entrance, but you should be able to find it. Good luck and let me know what you think of it! An astoundingly comprehensive and informative write-up on the island. Keep up the good work!